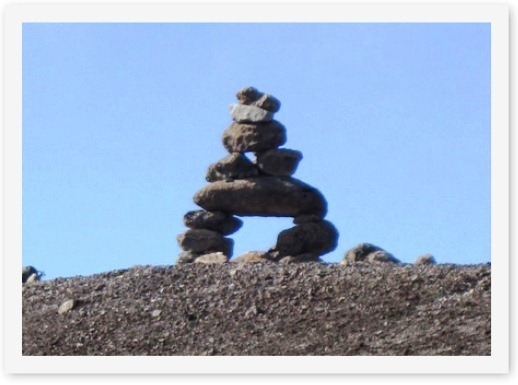 M.G. 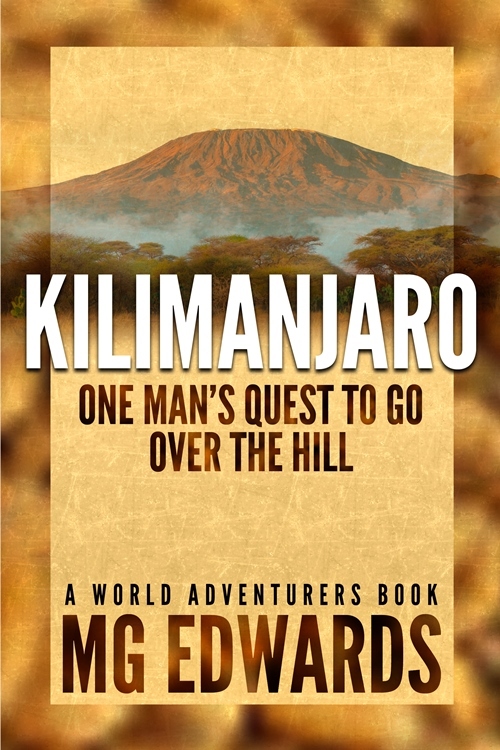 Edwards’ debut book, Kilimanjaro: One Man’s Quest to Go Over the Hill, has been nominated for the 2012 Global Ebook Award in two categories, Inspirational/Visionary – Non-Fiction and Sports/Fitness/Recreation – Non-Fiction. 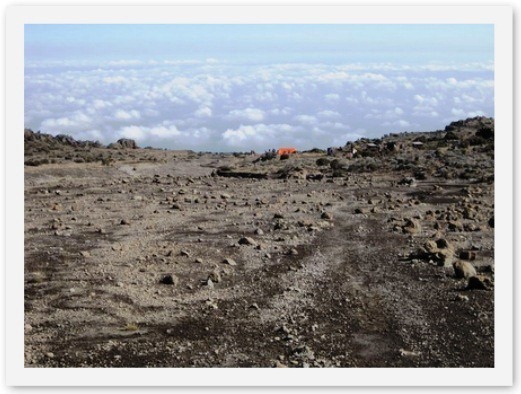 Kilimanjaro is a memoir chronicling the author’s attempt to summit Mount Kilimanjaro, the highest mountain in Africa. 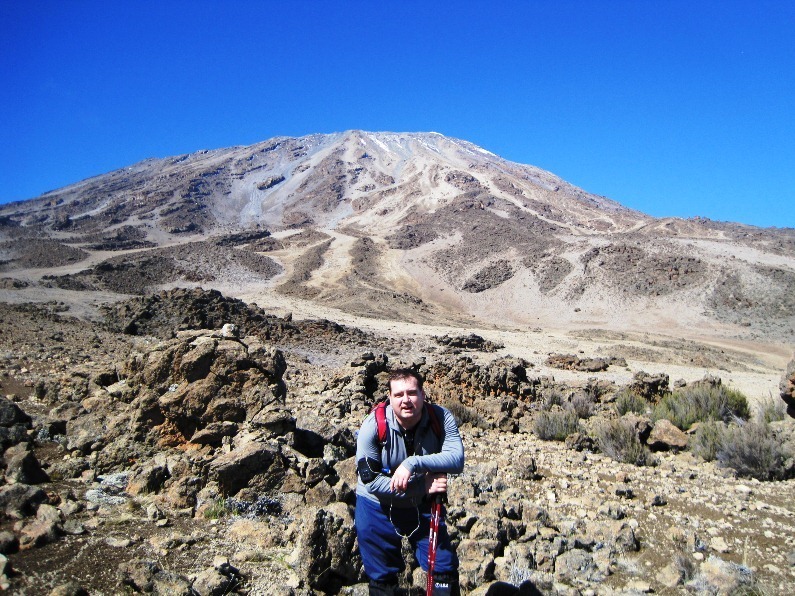 At forty years old and on the verge of a midlife crisis, he tried to change his life by climbing a mountain. 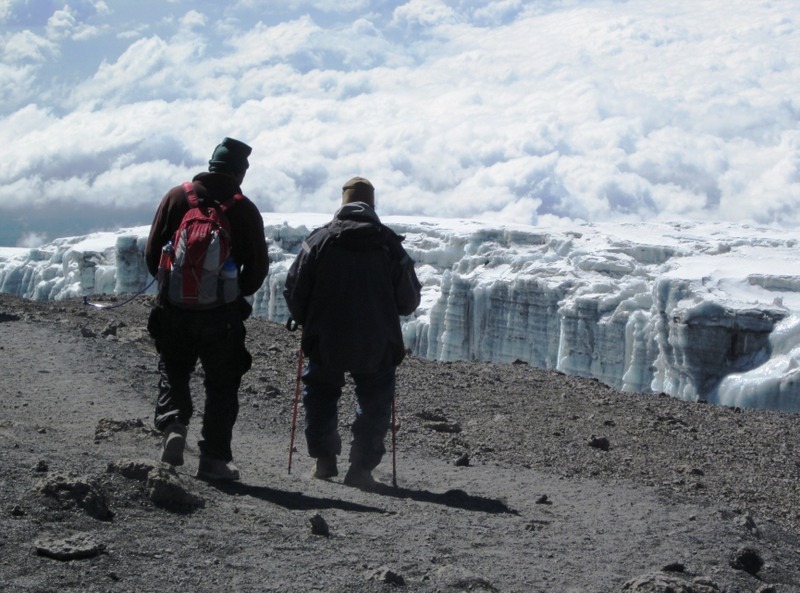 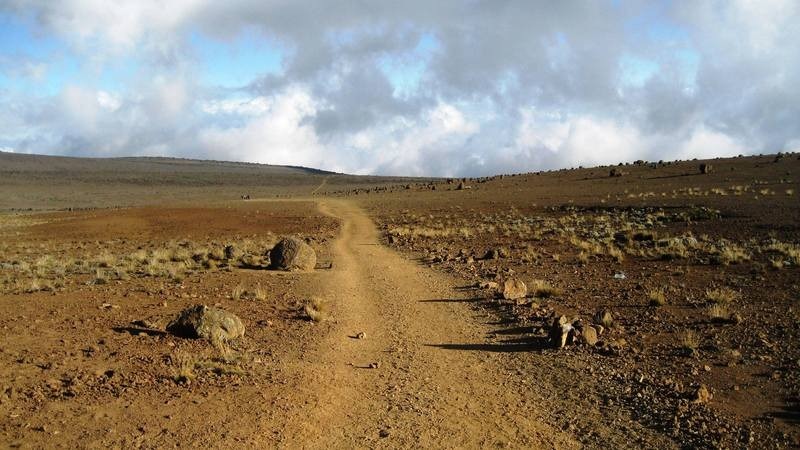 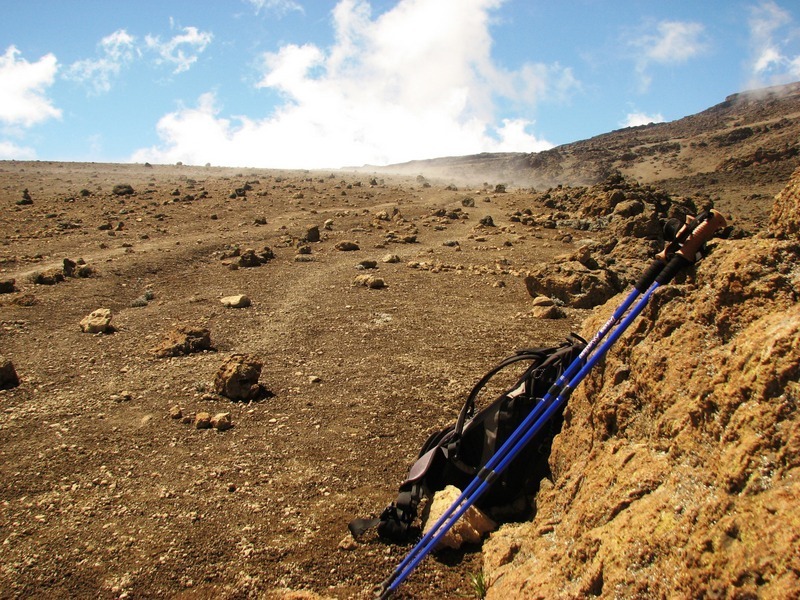 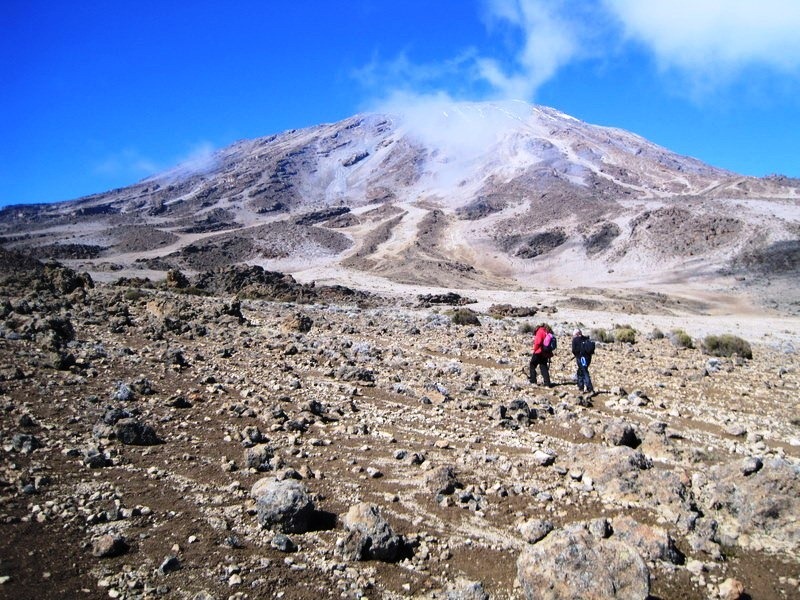 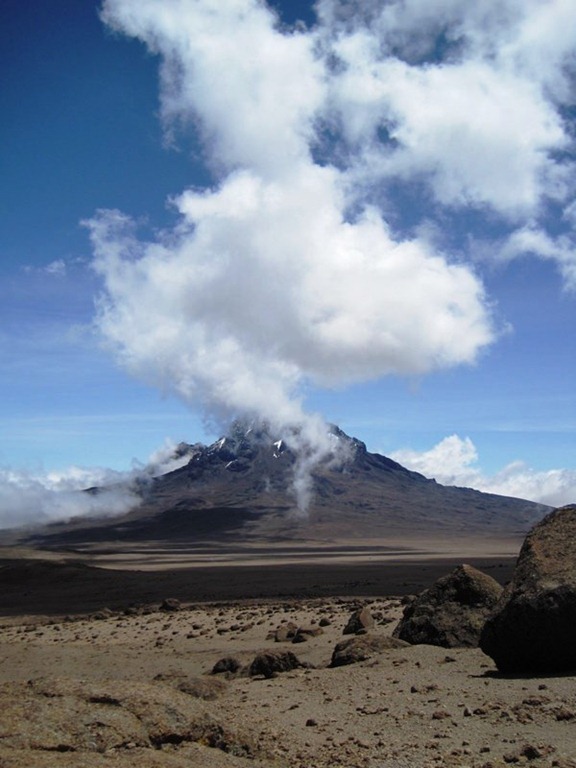 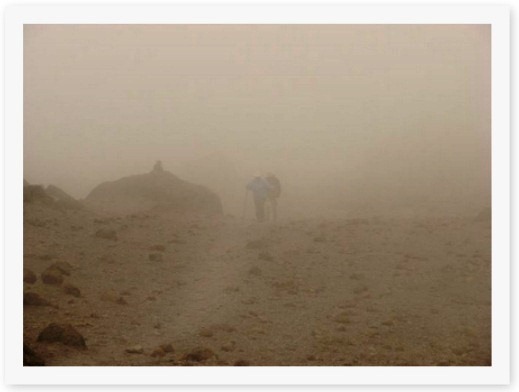 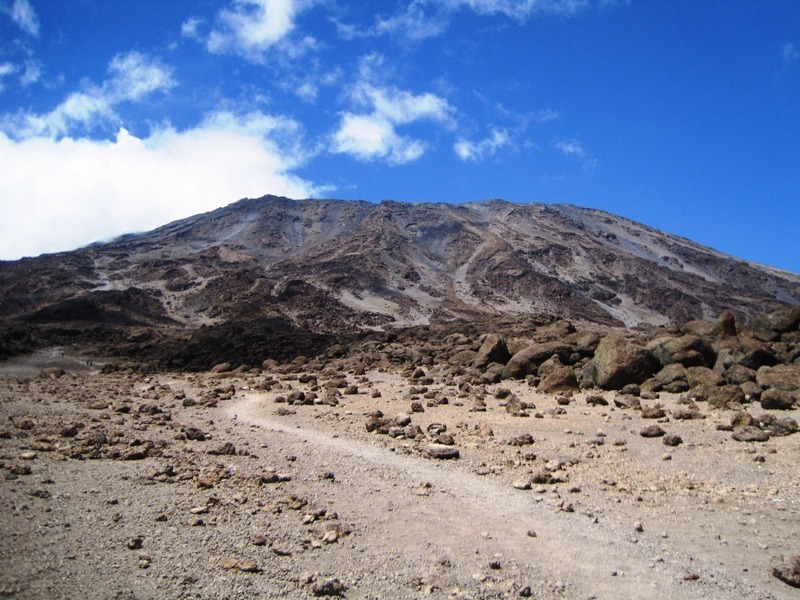 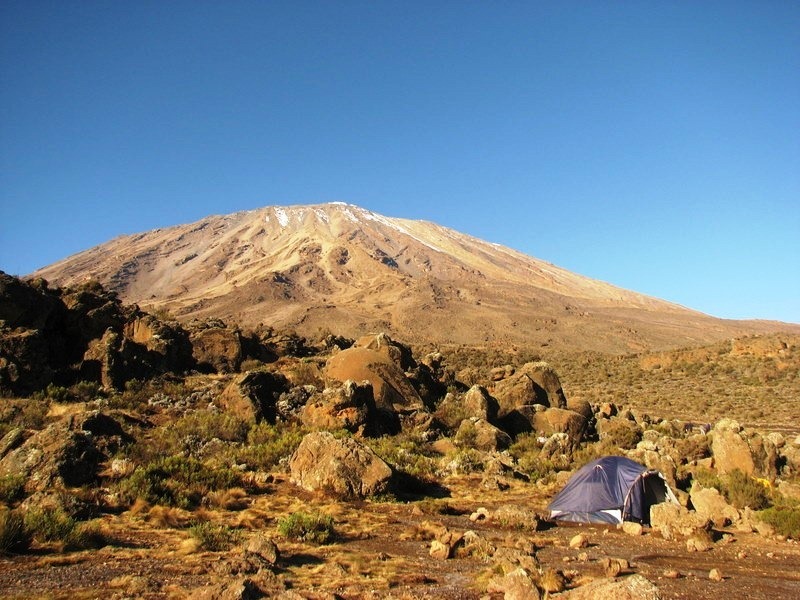 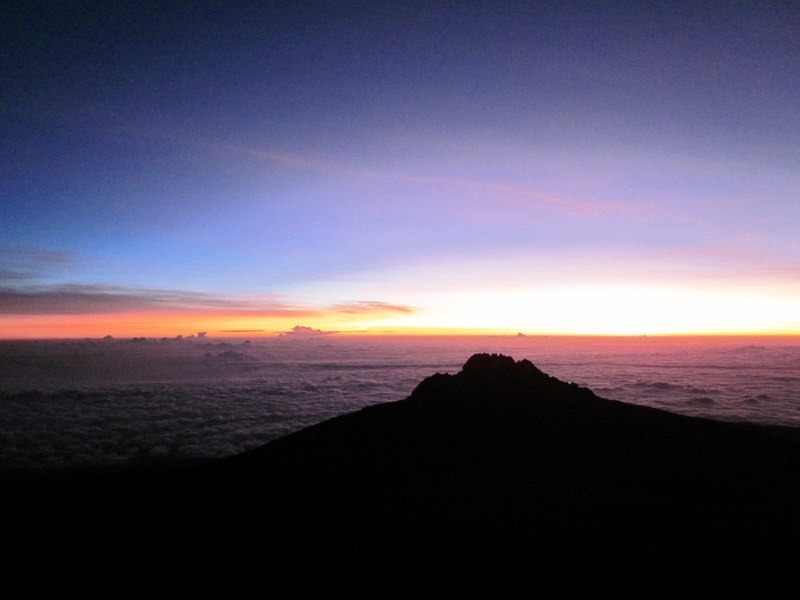 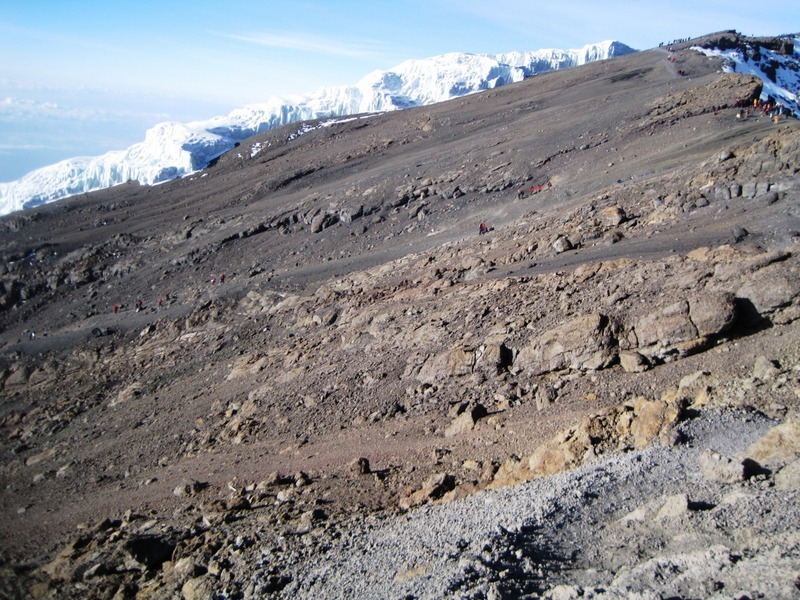 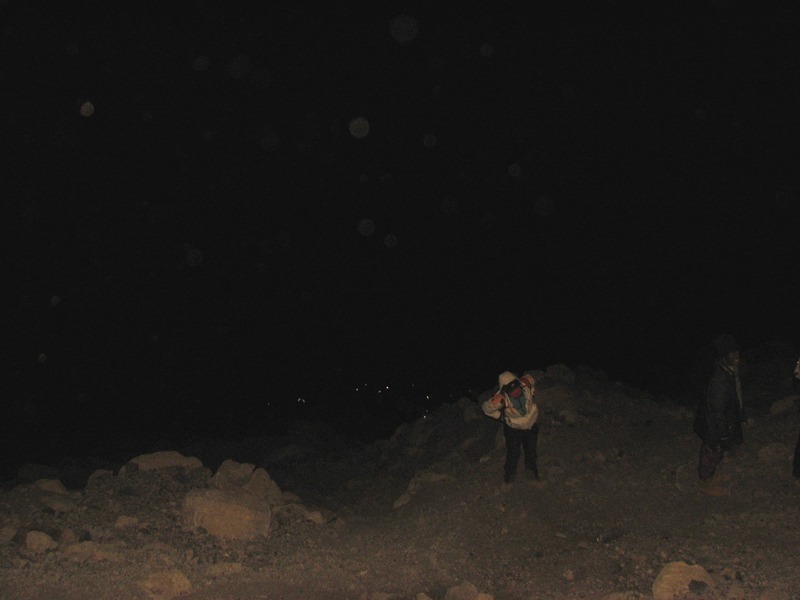 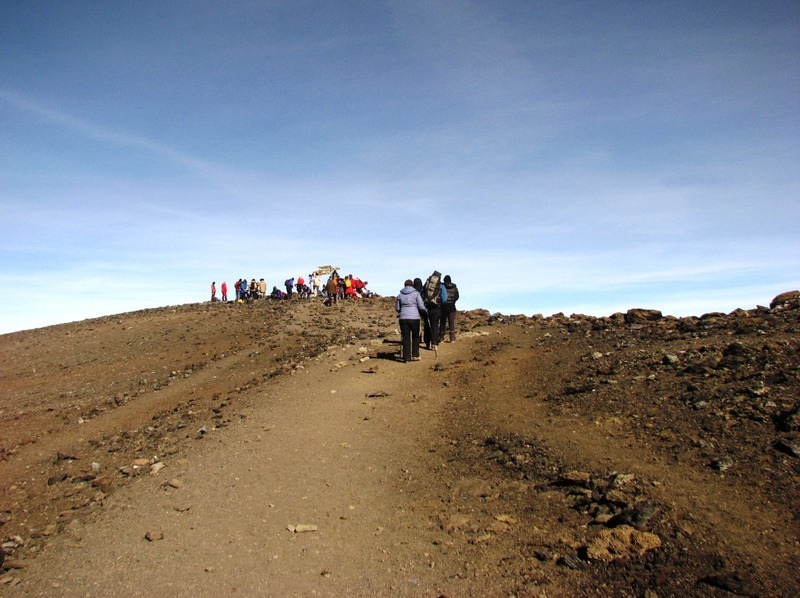 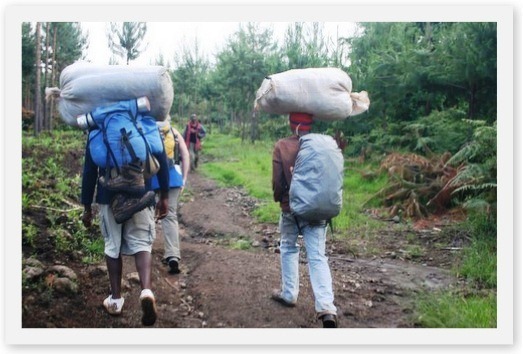 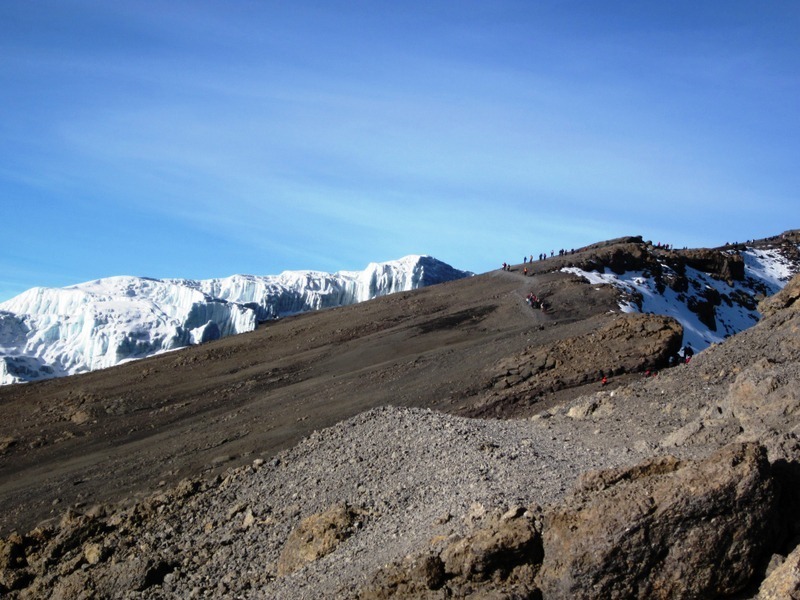 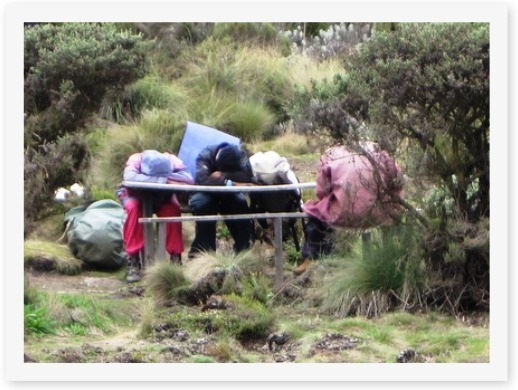 This is his true story of facing Kilimanjaro and other challenges at middle age. 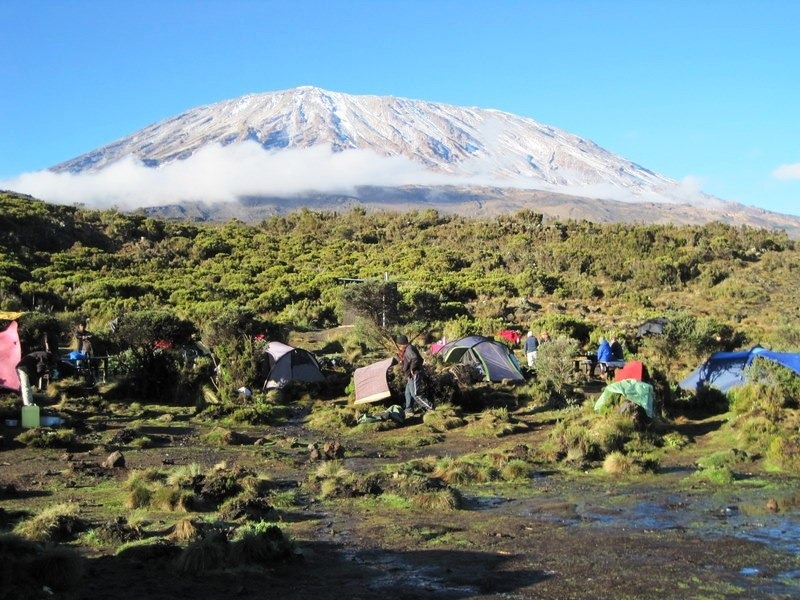 Readers rave about Kilimanjaro, calling it “life changing,” “inspirational,” and “an epic journey of self-discovery.” This book is for anyone who feels over the hill and needs encouragement to make a life change in the face of difficult odds. 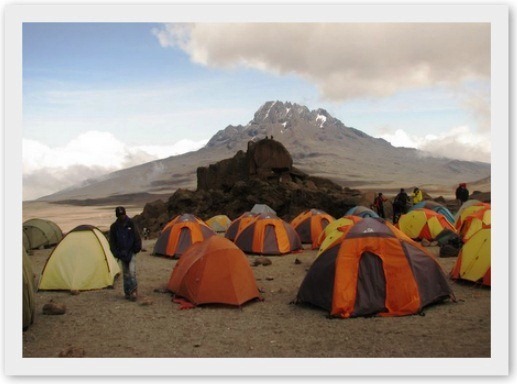 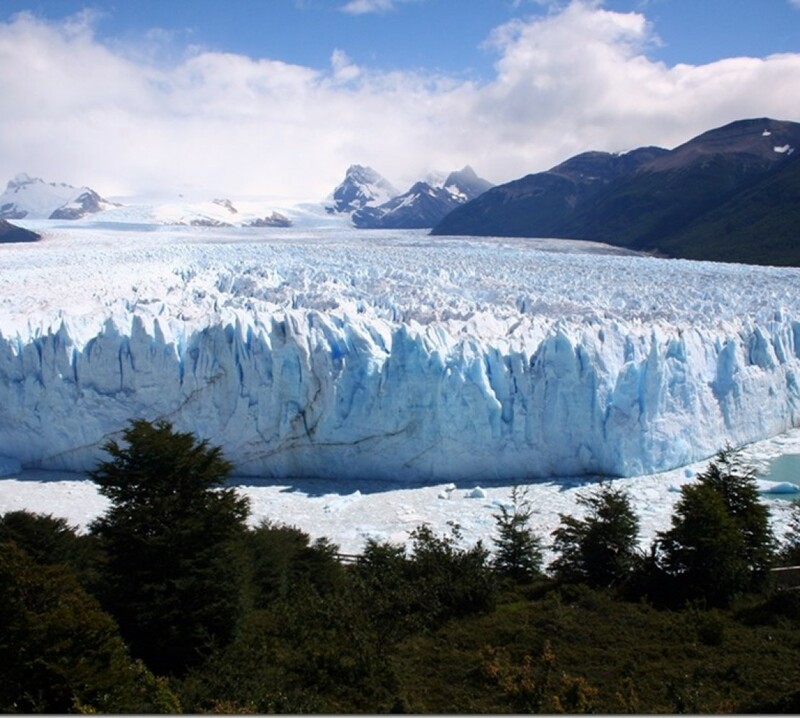 It’s also for the casual climber, mountaineer, or hiker who is interested climbing one of the world’s tallest mountains. 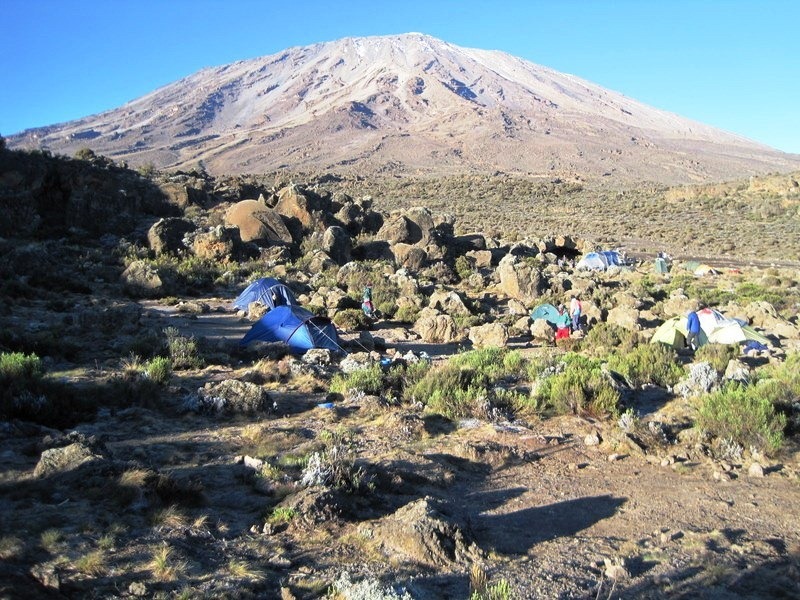 Filled with insights and advice for those who are contemplating their own Kilimanjaro climb, this book will put you on the mountain and inspire you to go over it. 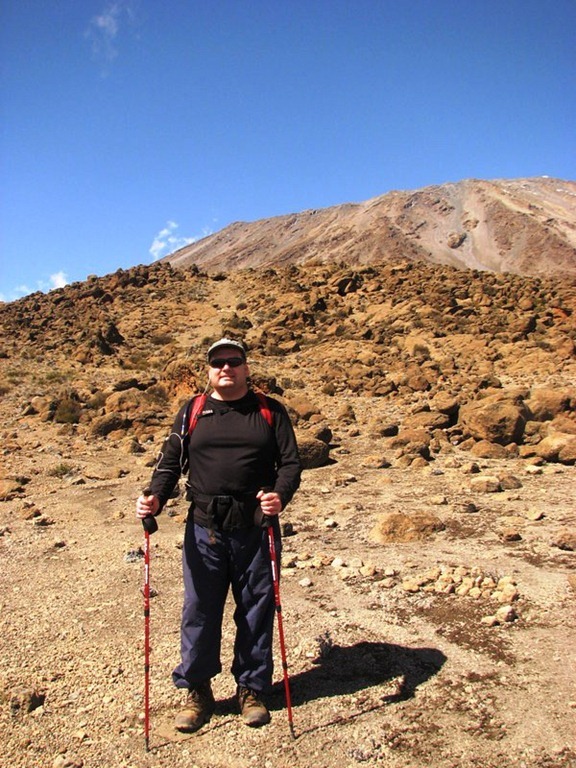 Edwards is a writer of books and stories in the mystery, thriller and science fiction-fantasy genres. 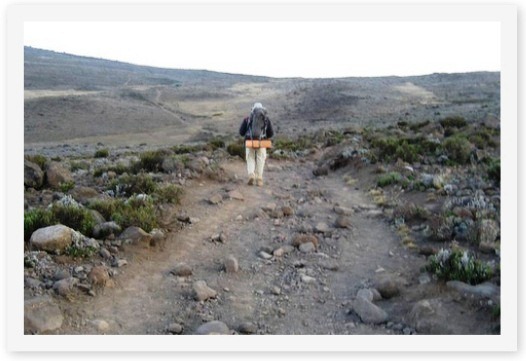 He also writes travelogues. 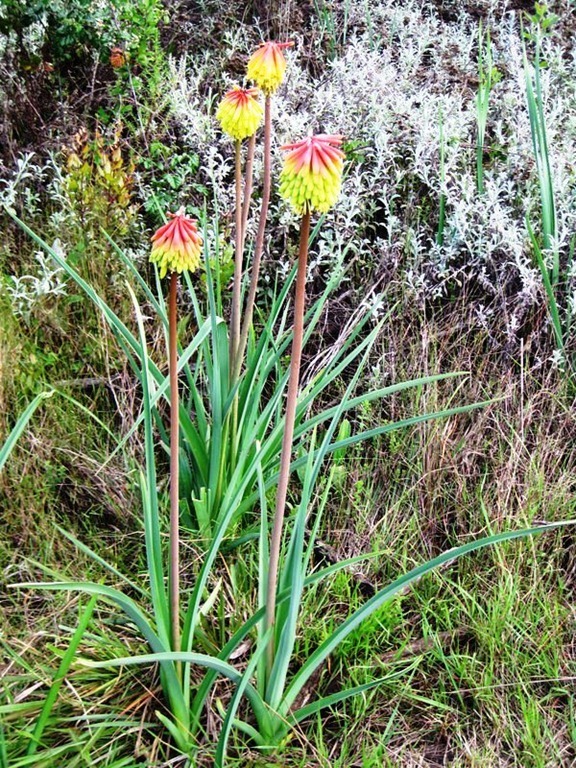 A former U.S. diplomat, he served in South Korea, Paraguay, and Zambia before leaving the Foreign Service to write full time. 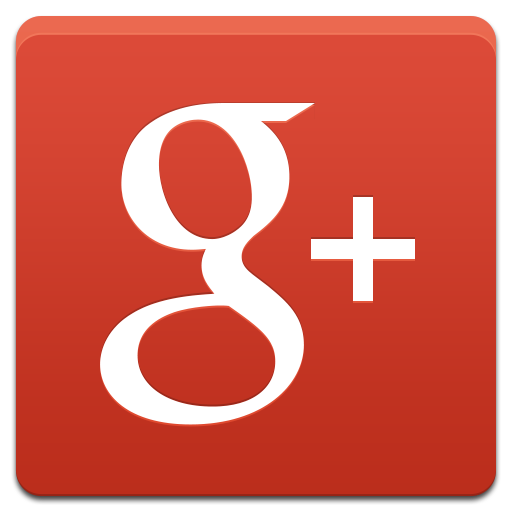 He lives in Bangkok, Thailand with his wife Jing and son Alex. 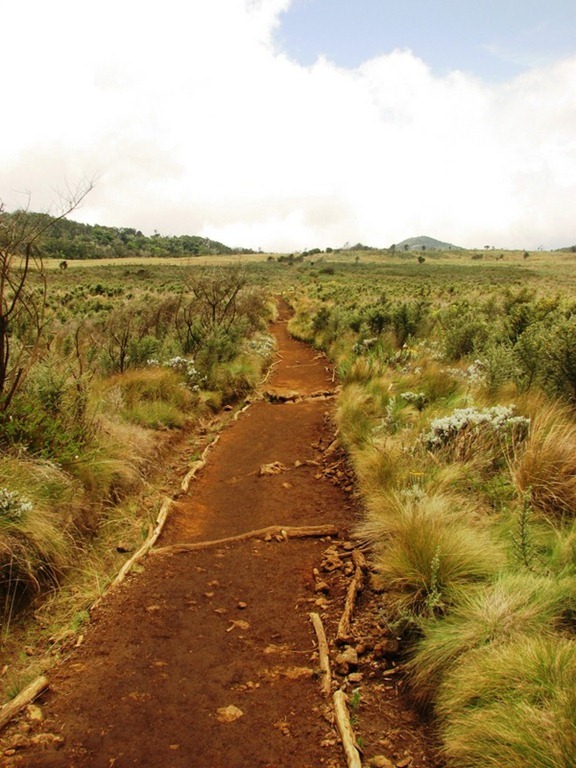 The Global Ebook Awards honor and bring attention to the future of book publishing: Ebooks. 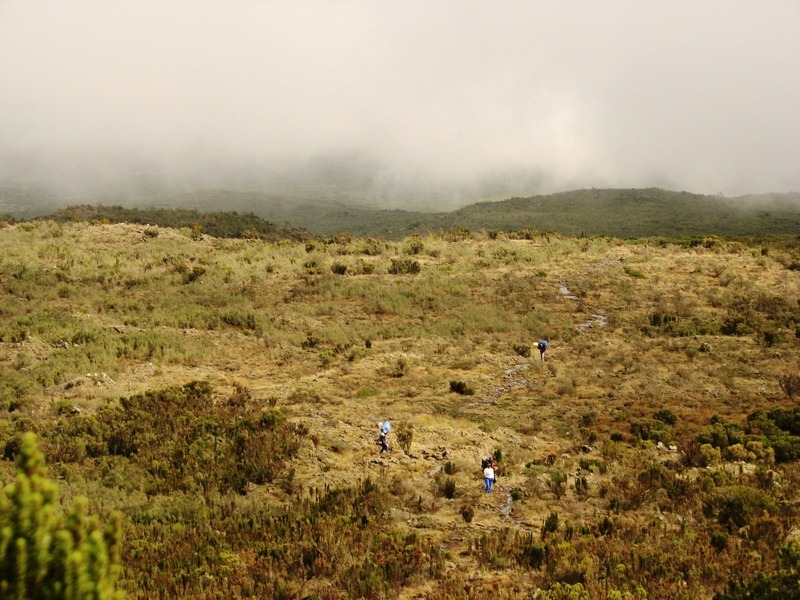 Now in its second year, the Awards are given in 72 specific categories. 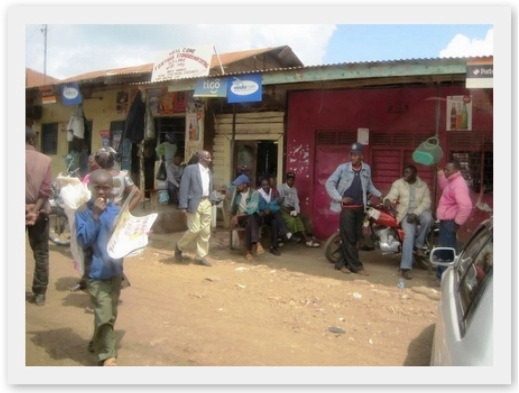 They are open to all publishers. 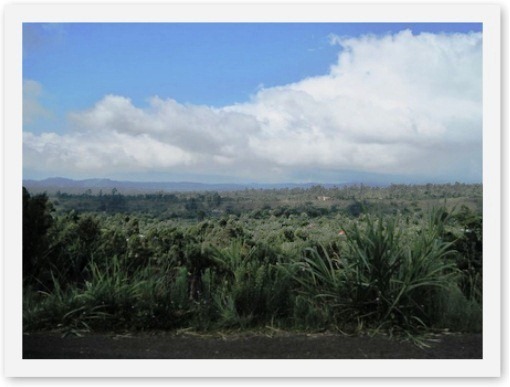 Each winner is chosen as best in its category rather than based on size or region. 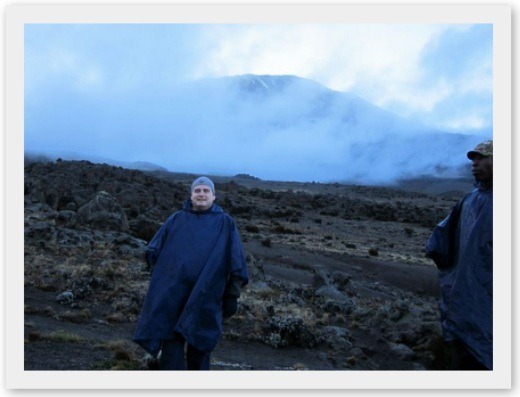 Submissions are judged by a panel of 250 judges who are experts in the categories and genres of the books nominated. 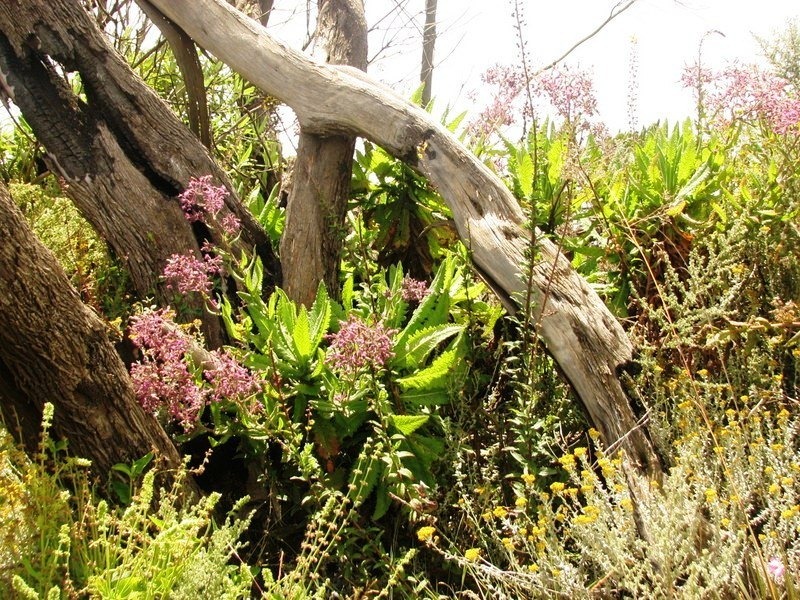 The awards ceremony will be held in Santa Barbara, California on August 18, 2012. 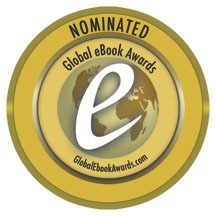 For more information, visit http://globalebookawards.com. 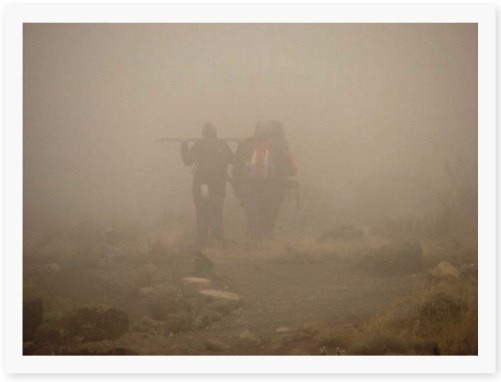 For more information about the book or M.G. 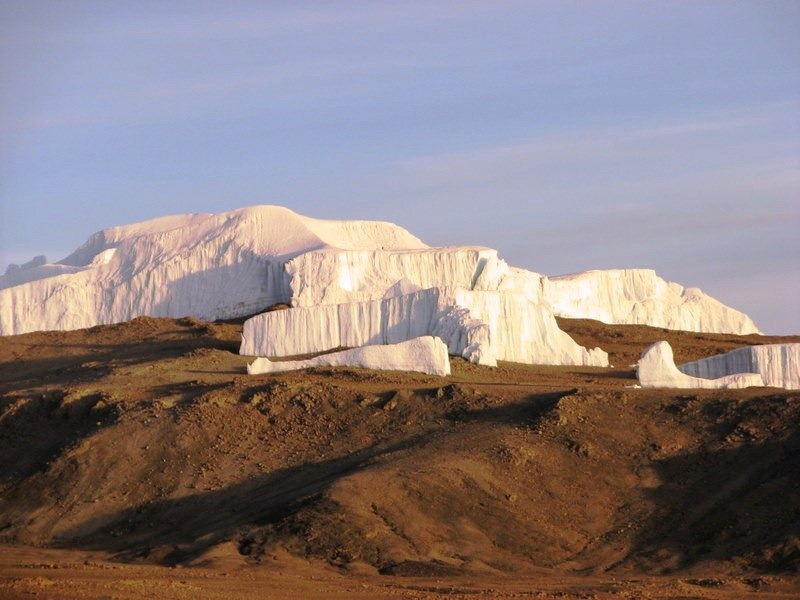 Edwards, visit www.mgedwards.com or worldadventurers.wordpress.com. 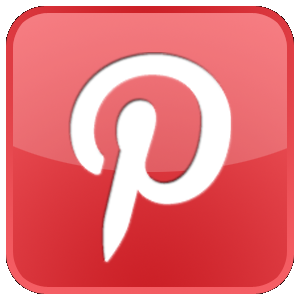 Contact him at me@mgedwards.com, on Facebook at www.facebook.com/migedwards/, or @m_g_edwards on Twitter. 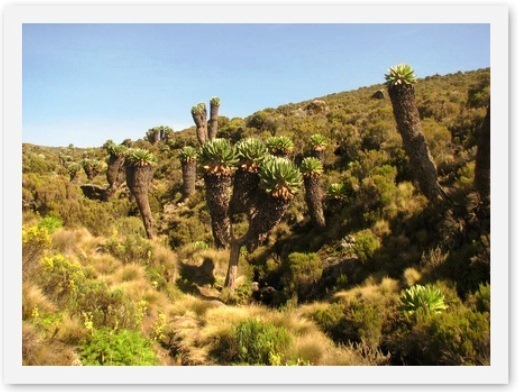 Plant life is featured in my book Kilimanjaro: One Man’s Quest to Go Over the Hill, which chronicles my attempt to summit Mount Kilimanjaro, the highest mountain in Africa. 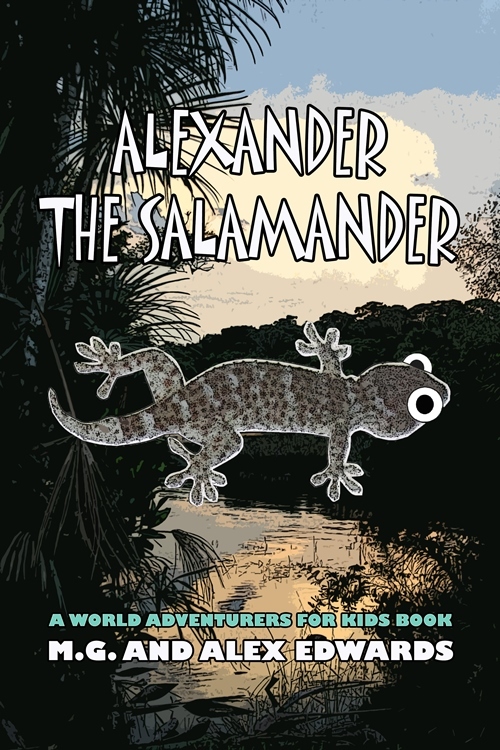 The book is on sale now as an e-book for $3.99 and in paperback for $9.99 from Amazon and other booksellers. 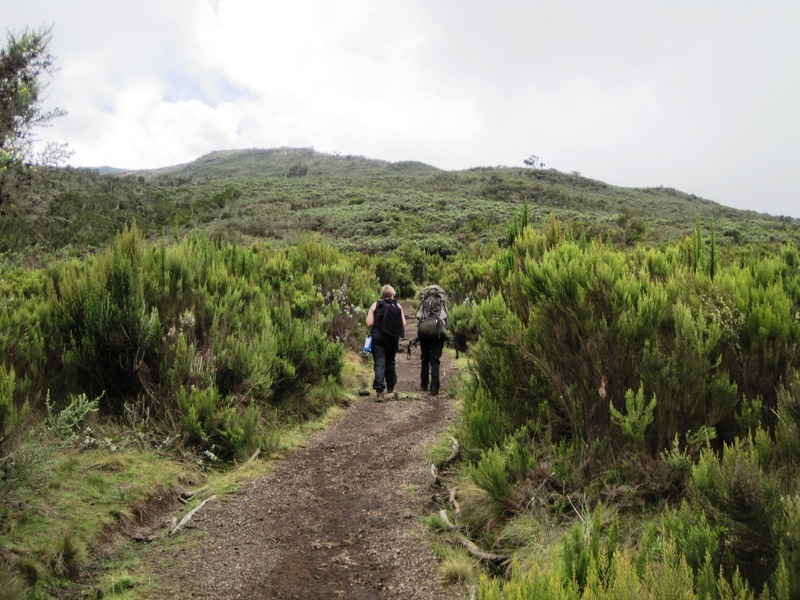 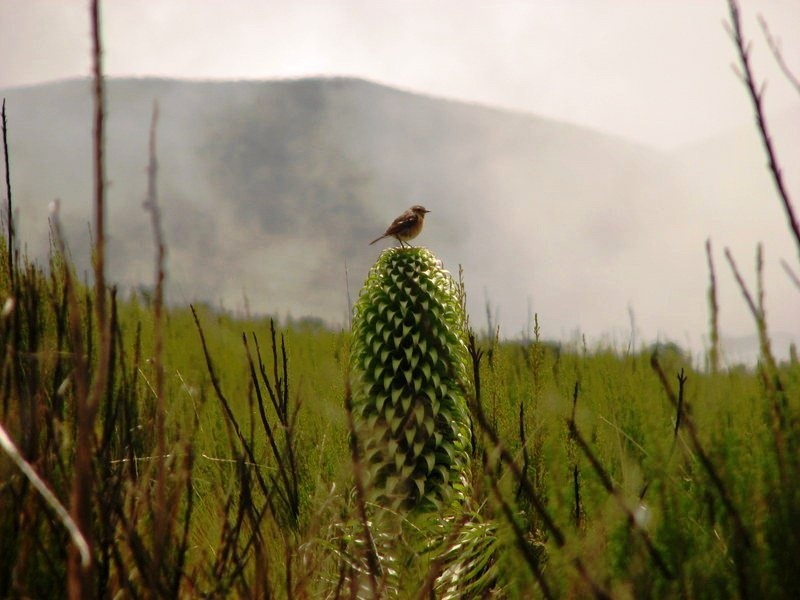 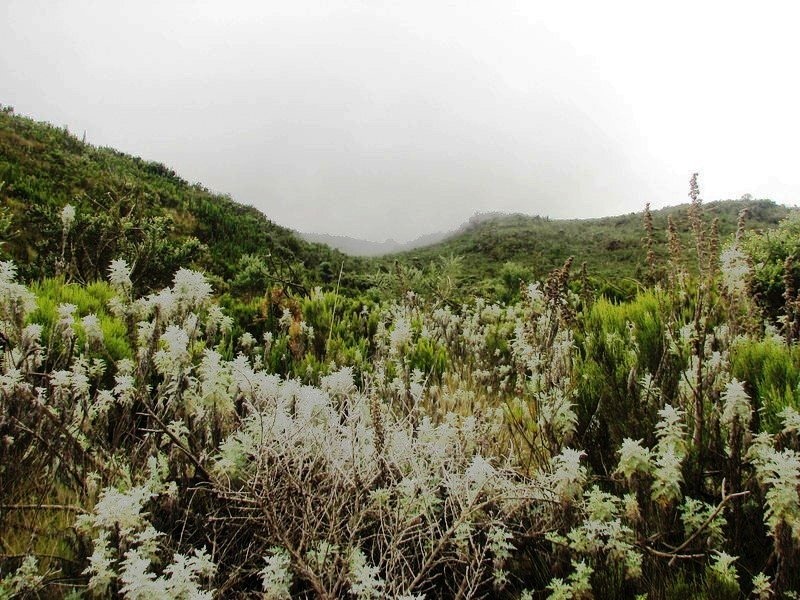 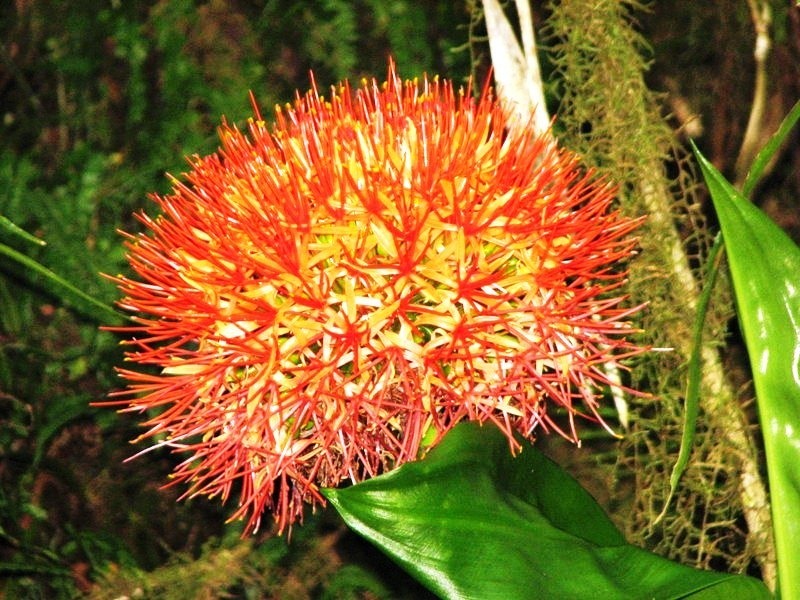 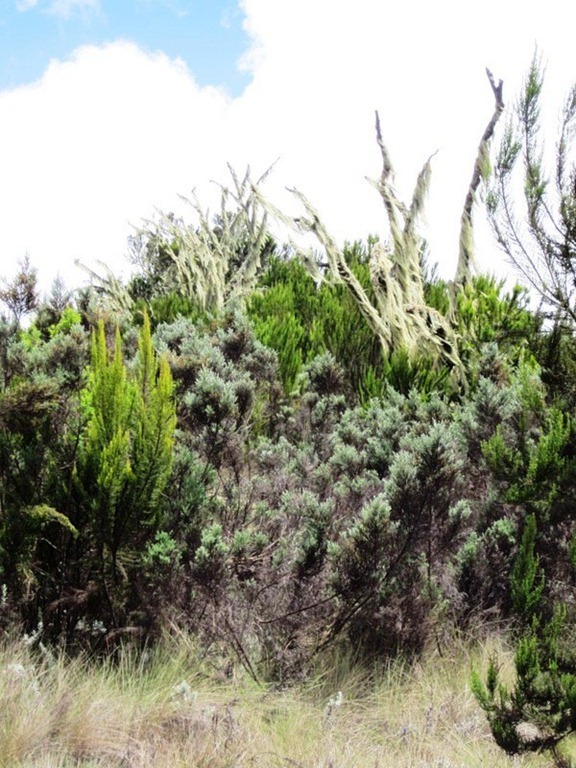 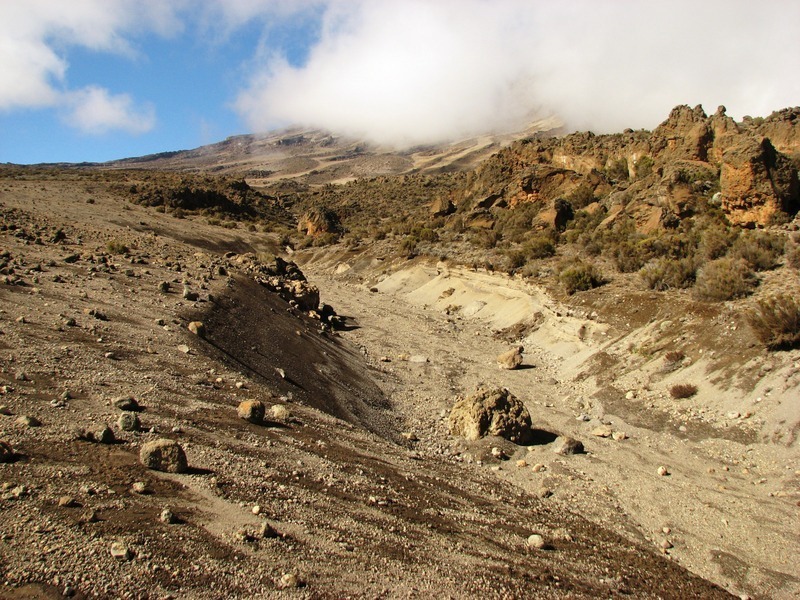 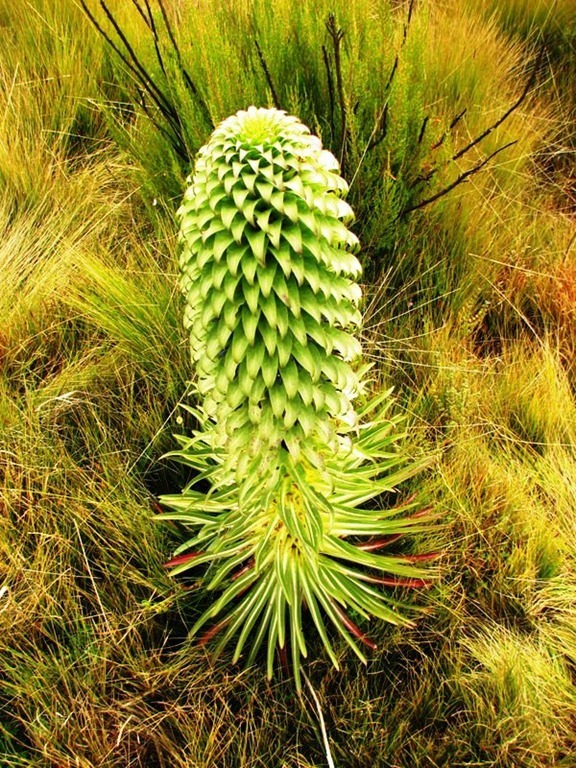 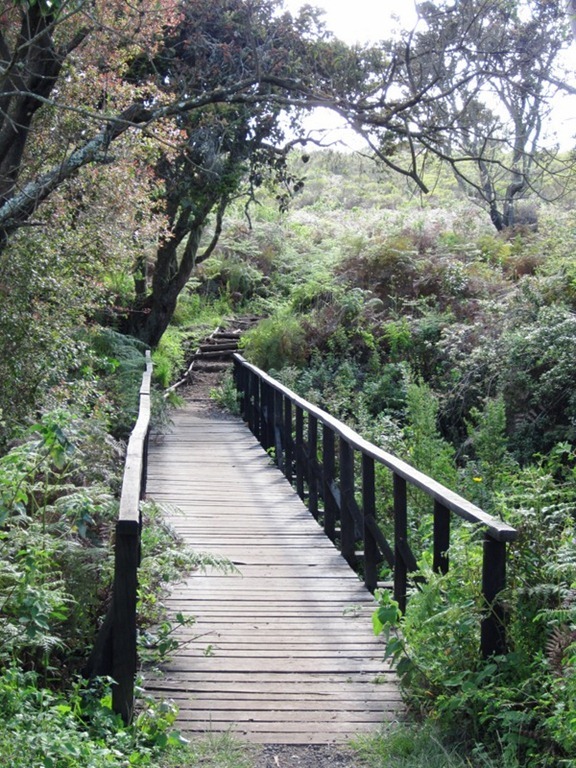 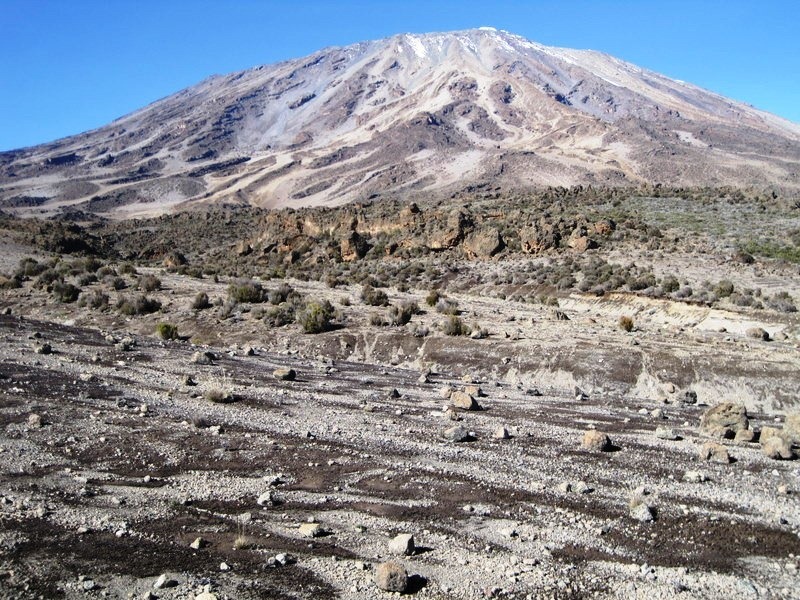 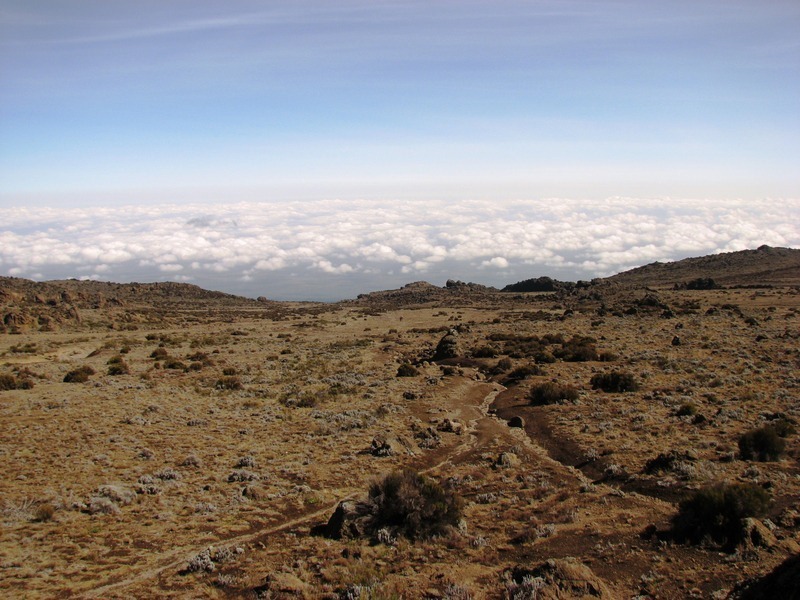 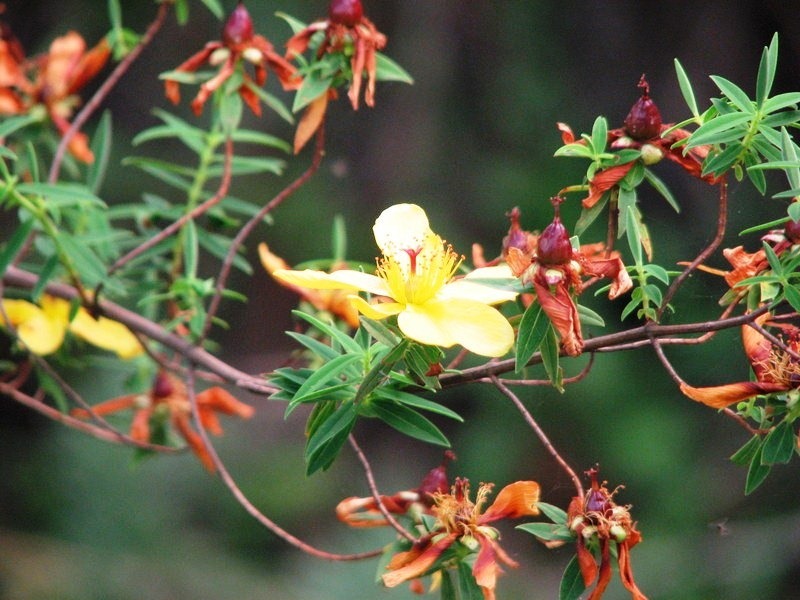 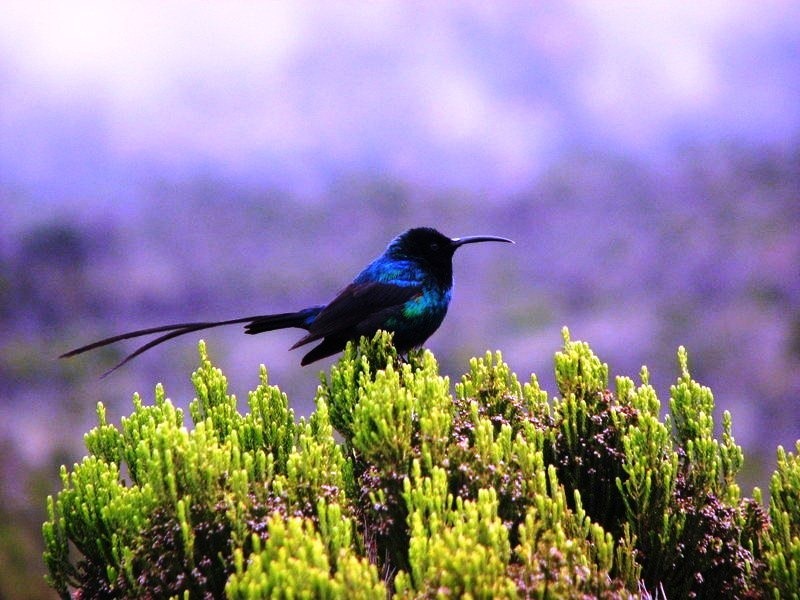 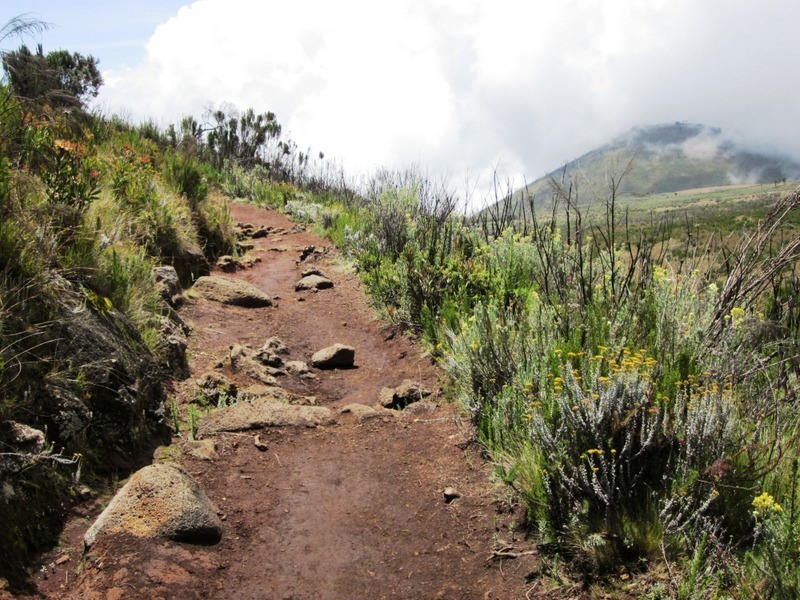 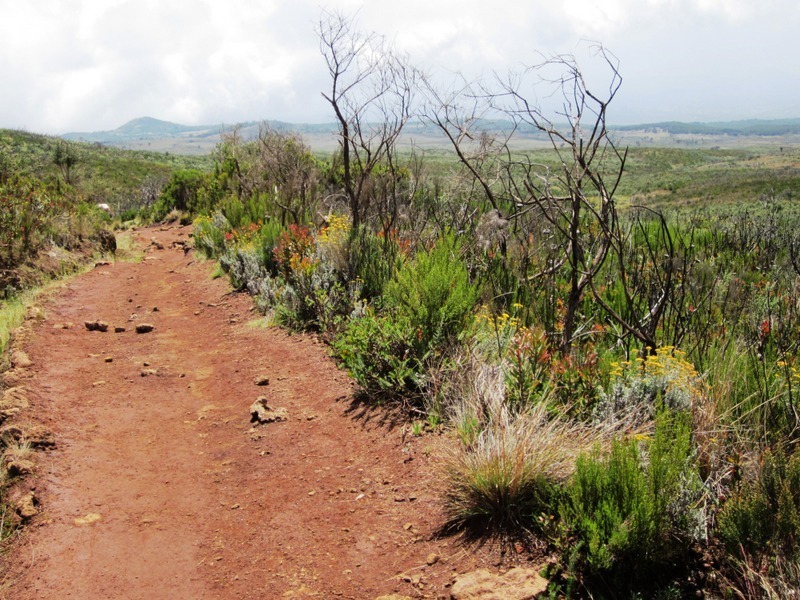 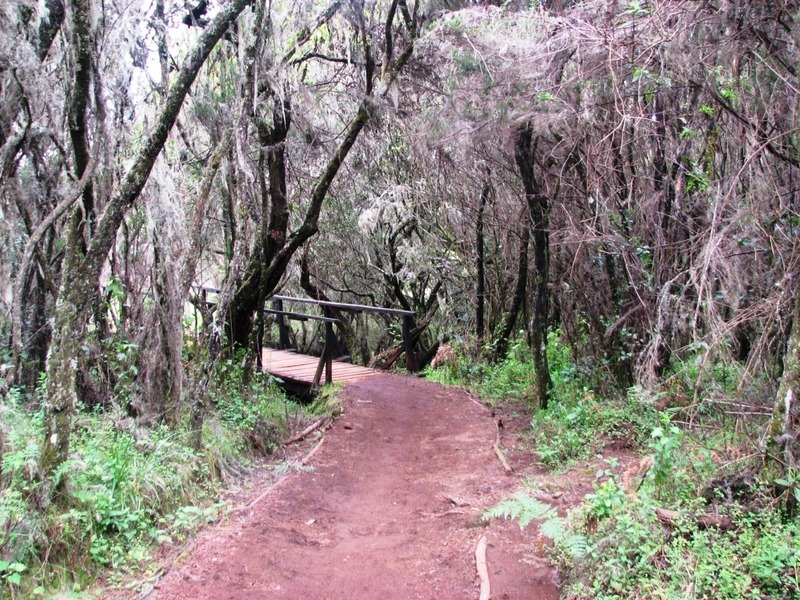 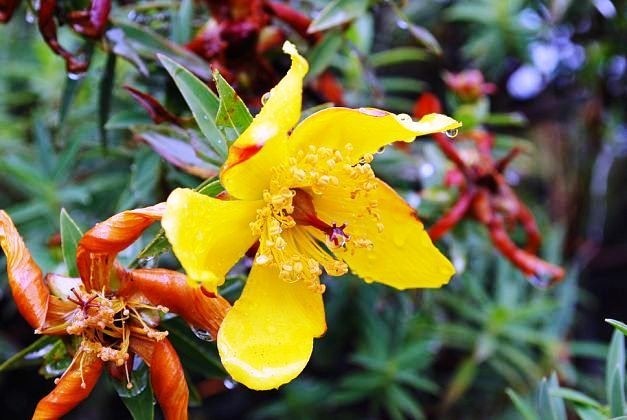 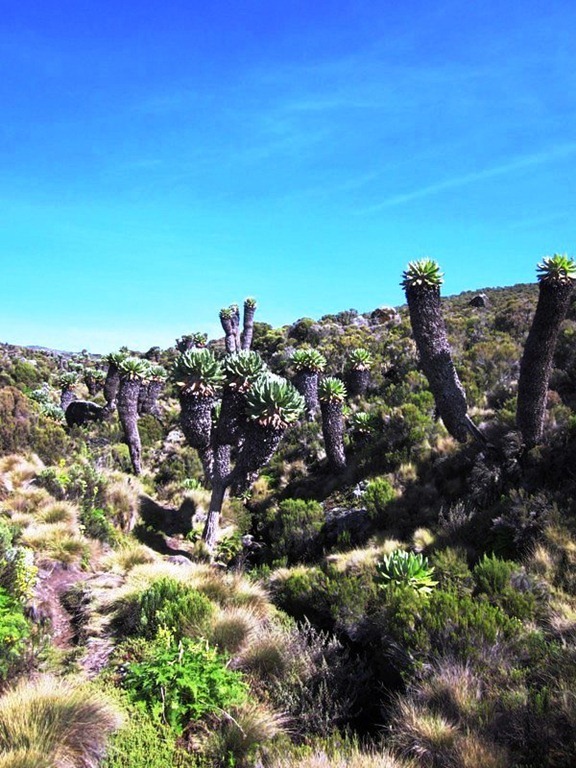 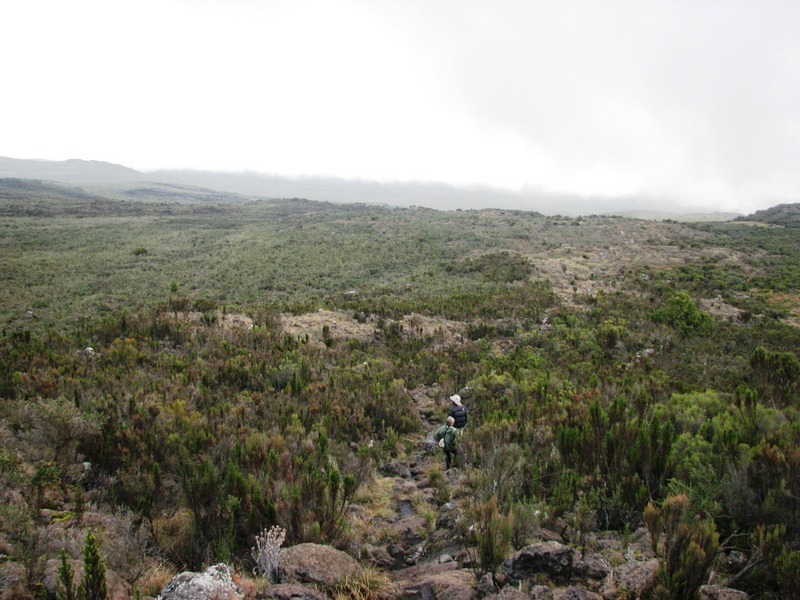 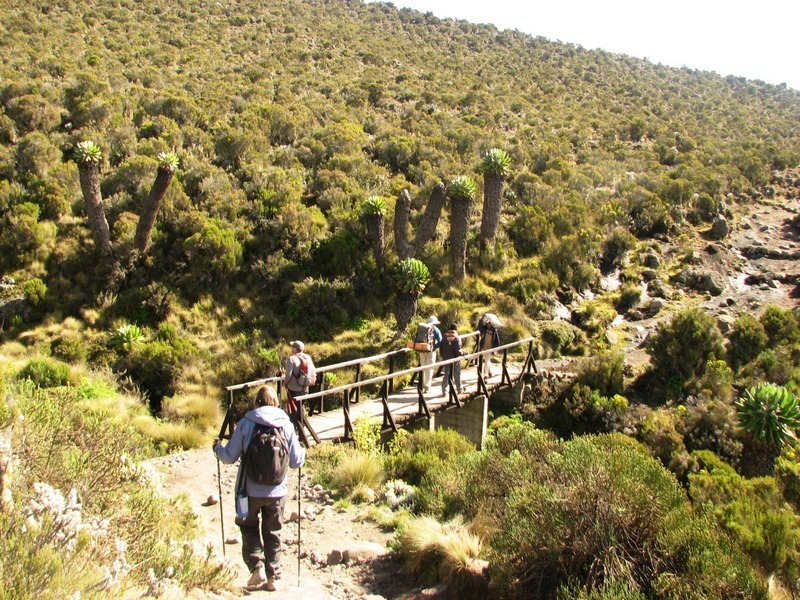 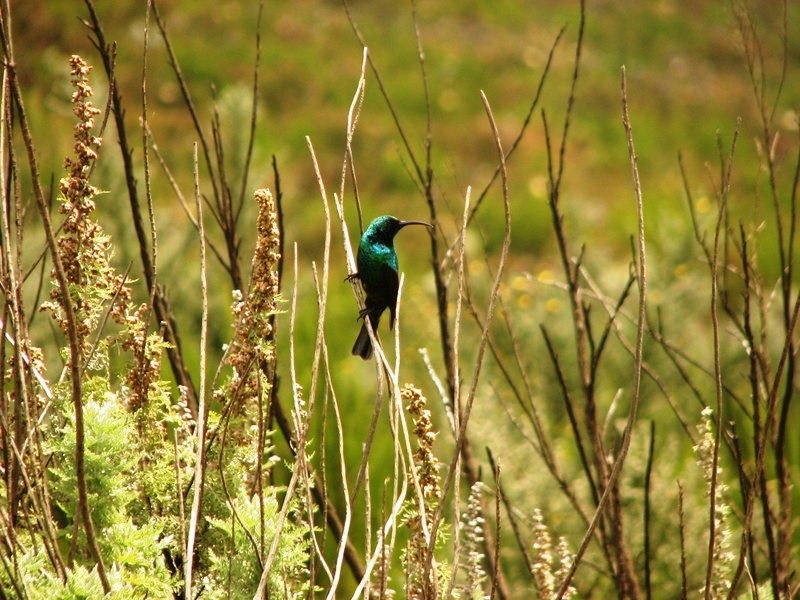 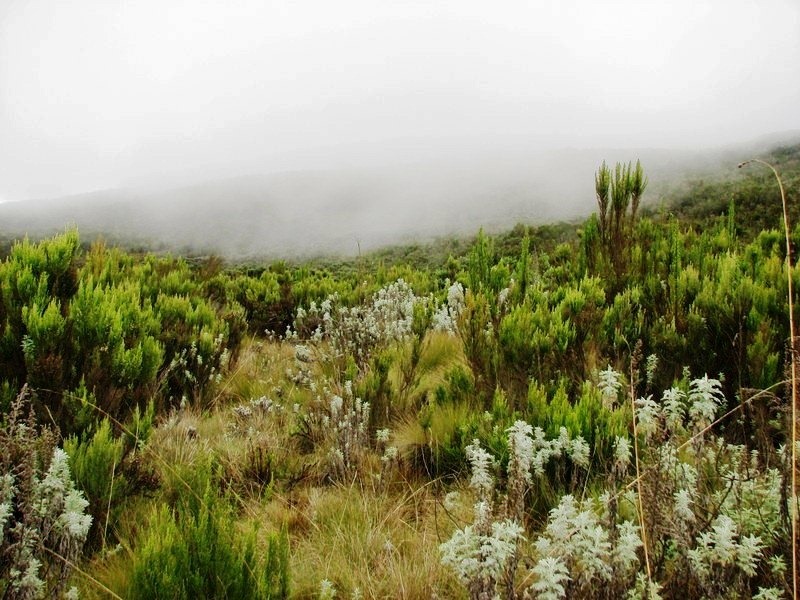 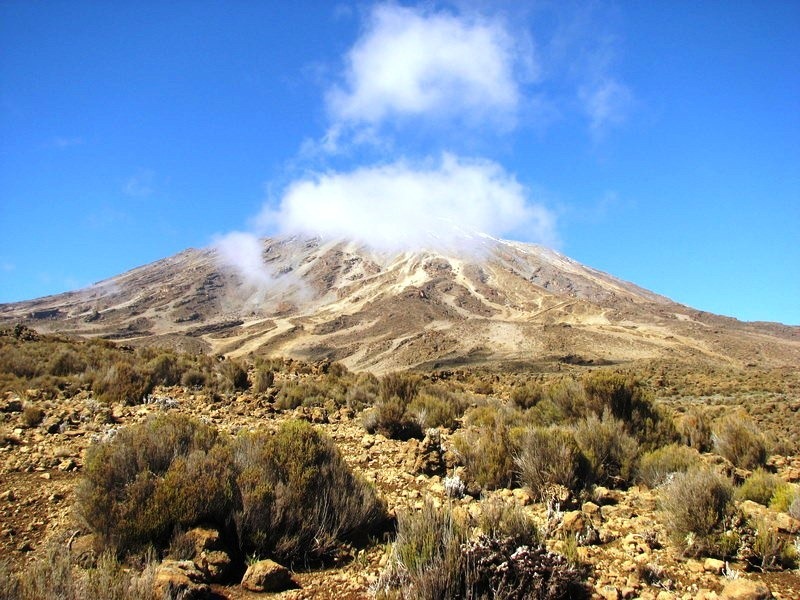 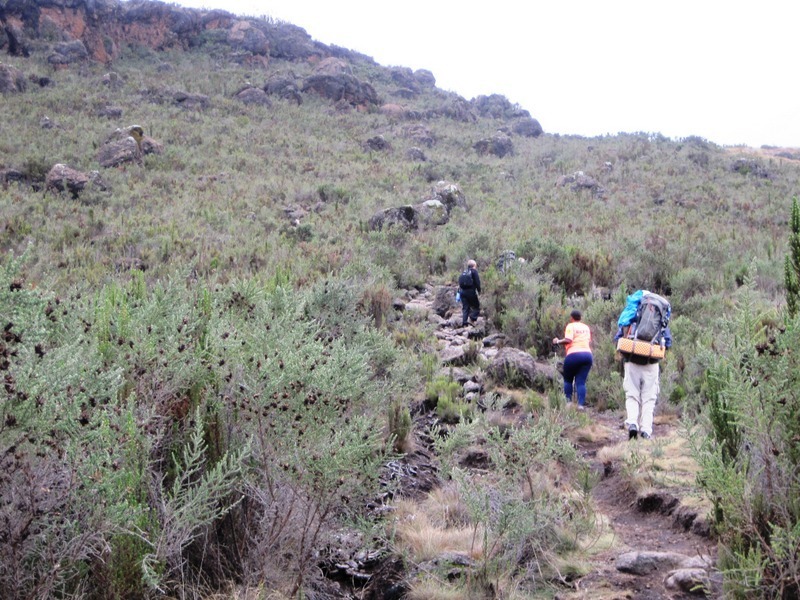 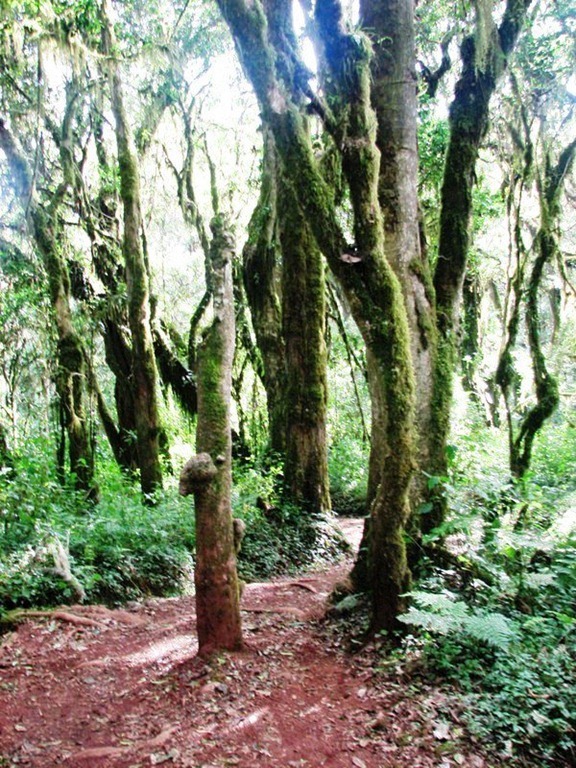 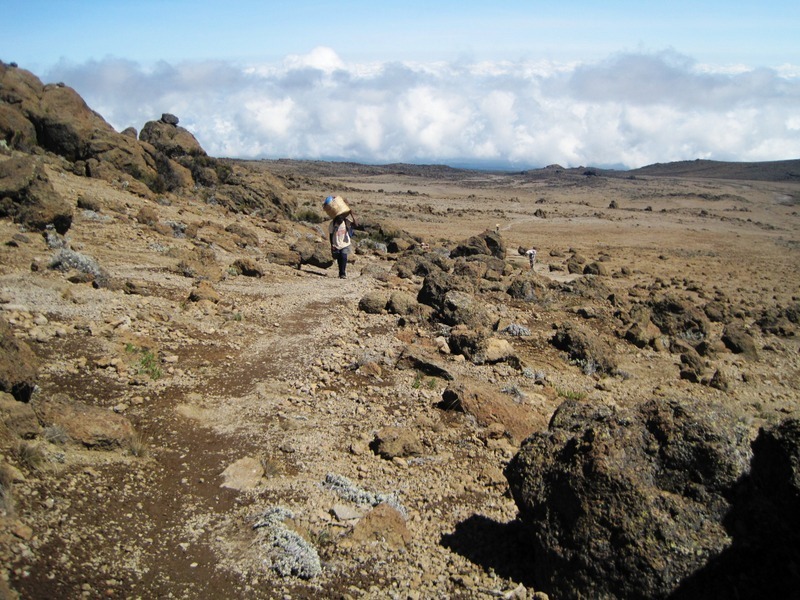 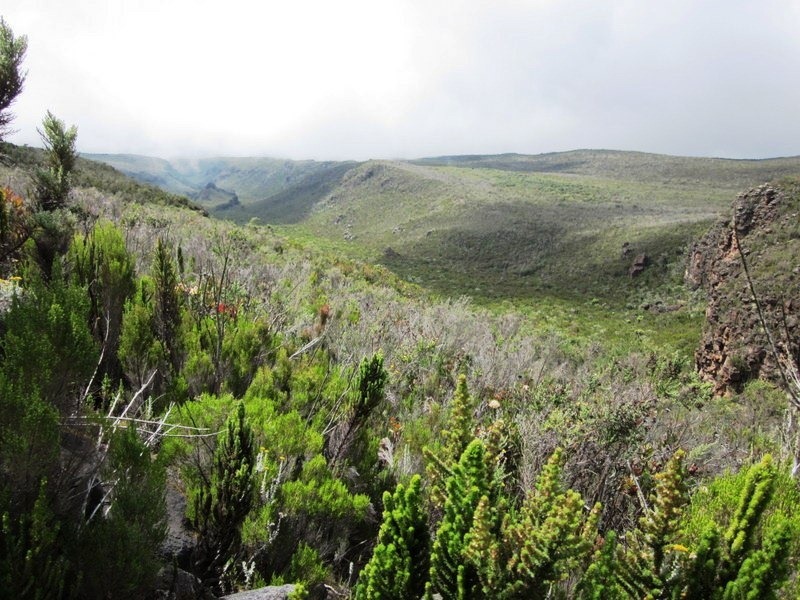 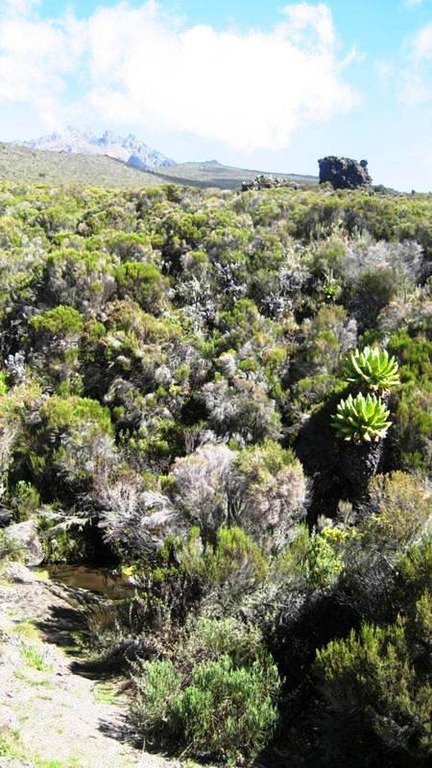 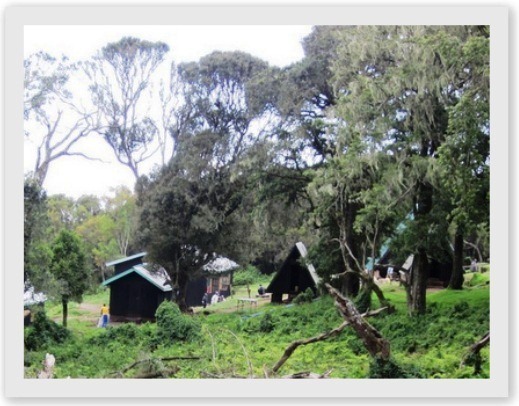 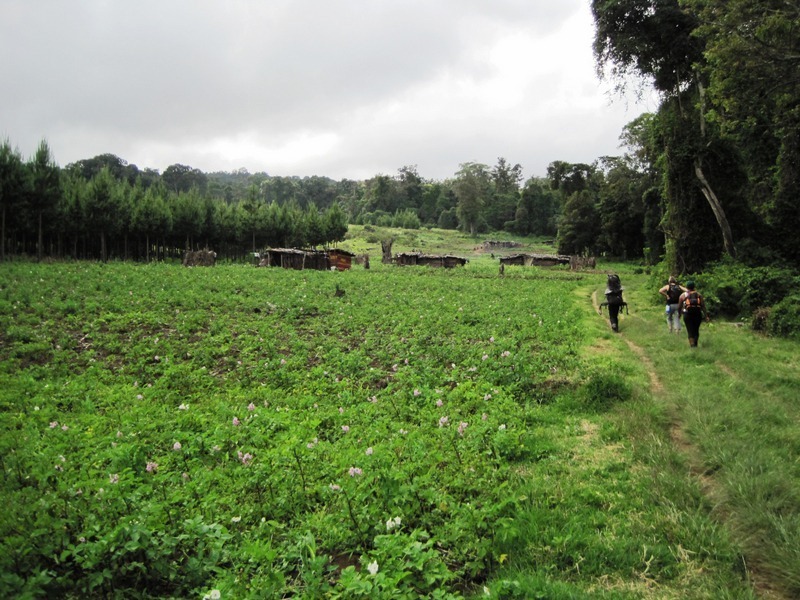 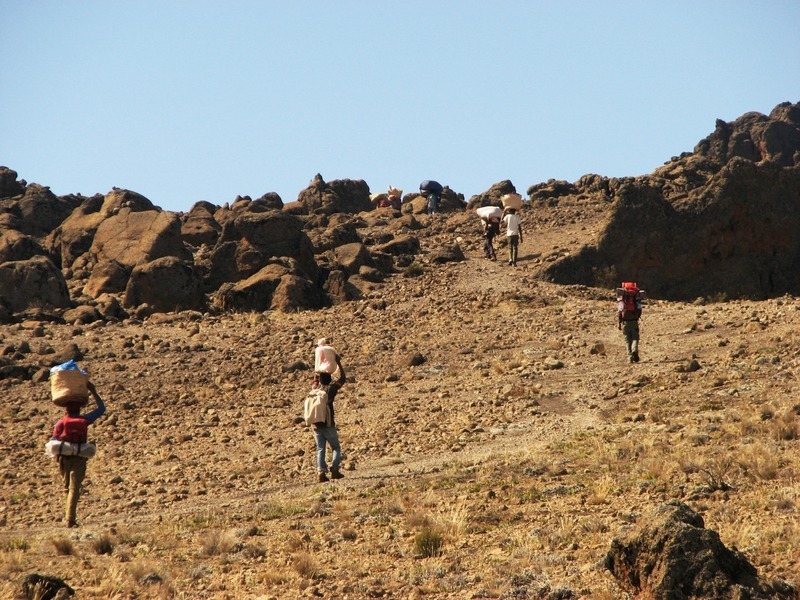 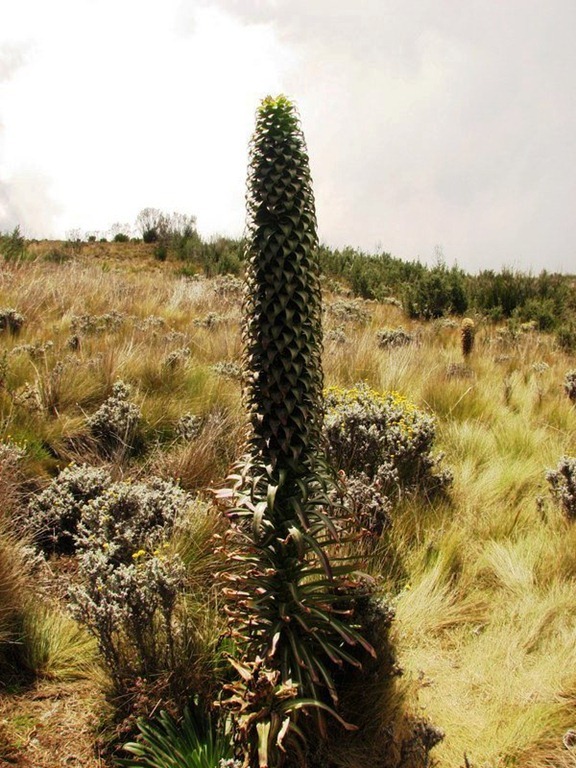 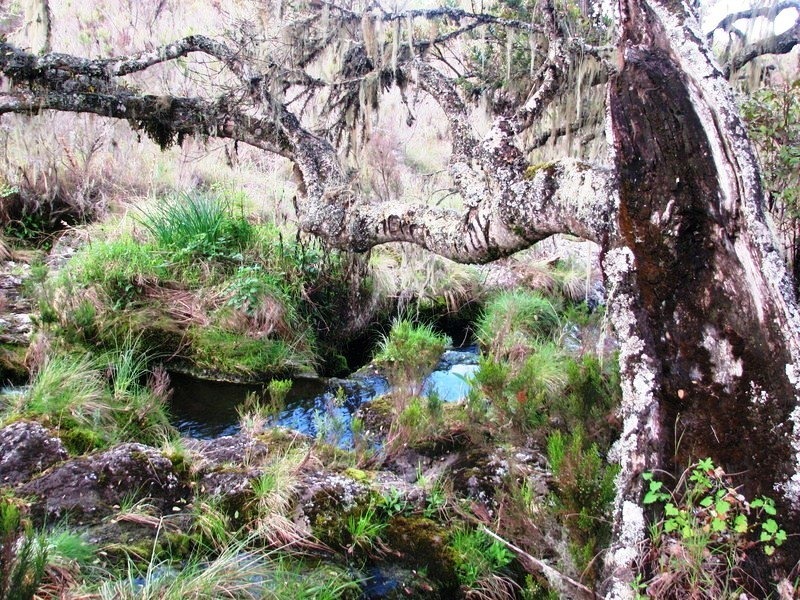 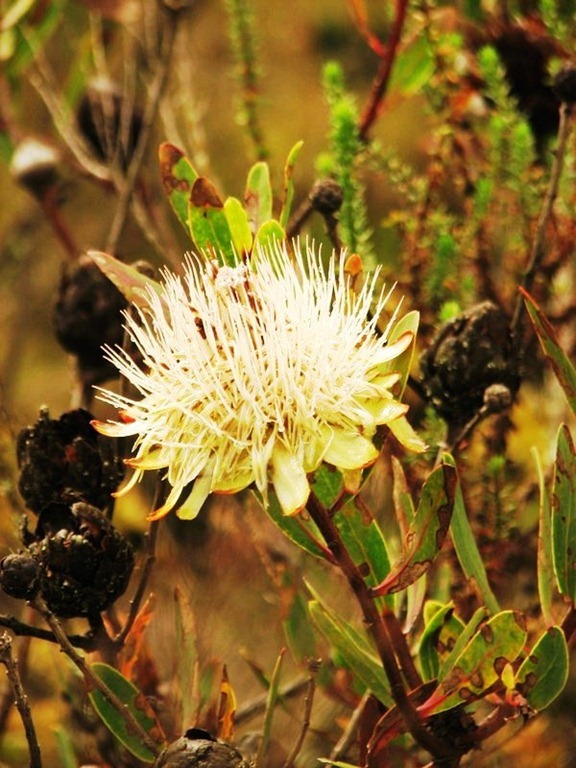 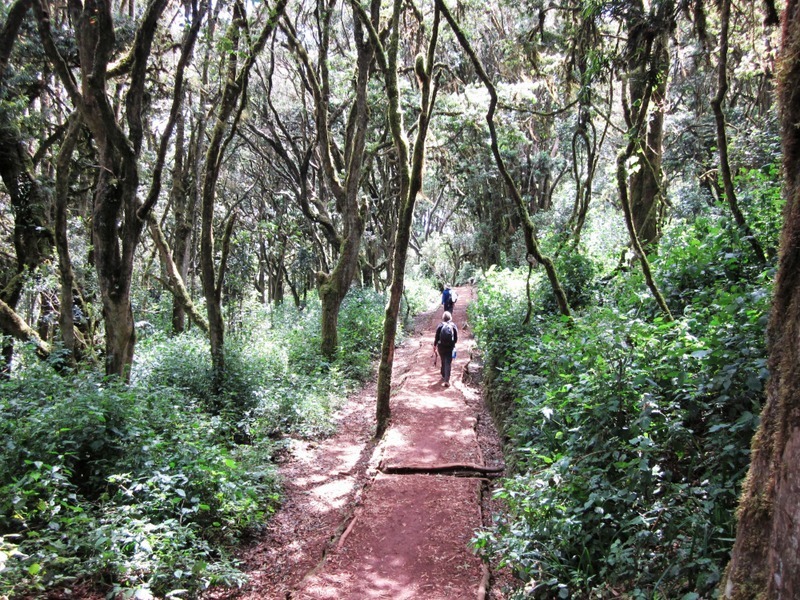 Diverse vegetation from different climate zones graces the slopes of Kilimanjaro. 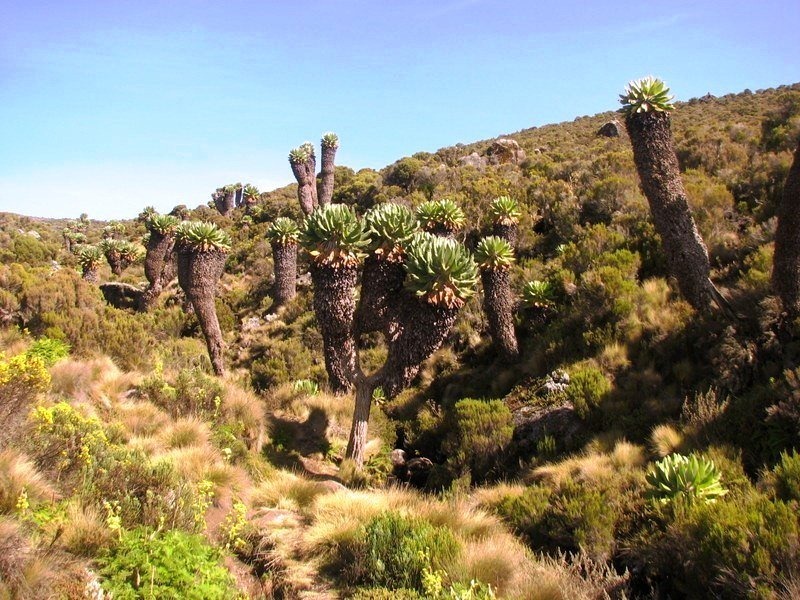 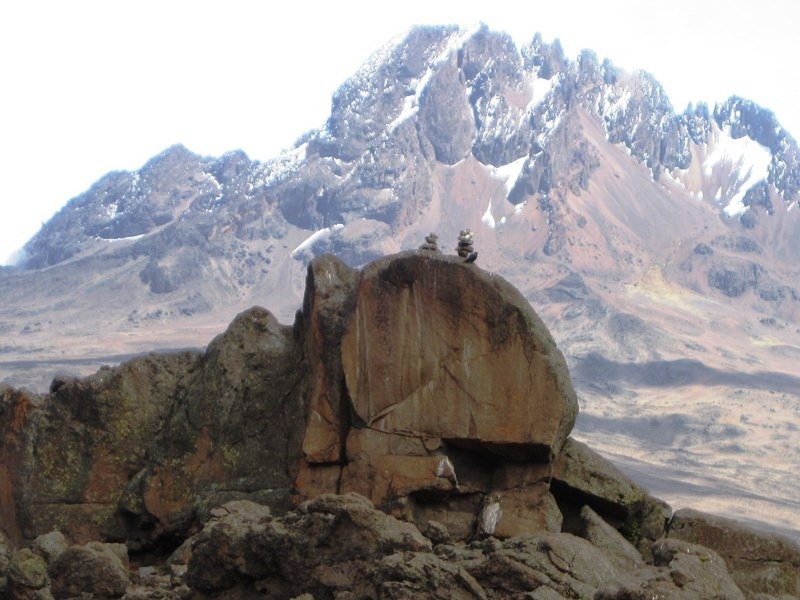 One of the more unique places on Earth, the mountain lies in Africa‘s Afromontane region that straddles the Equator with clusters of freestanding mountains and plateaus surrounded by lowlands. 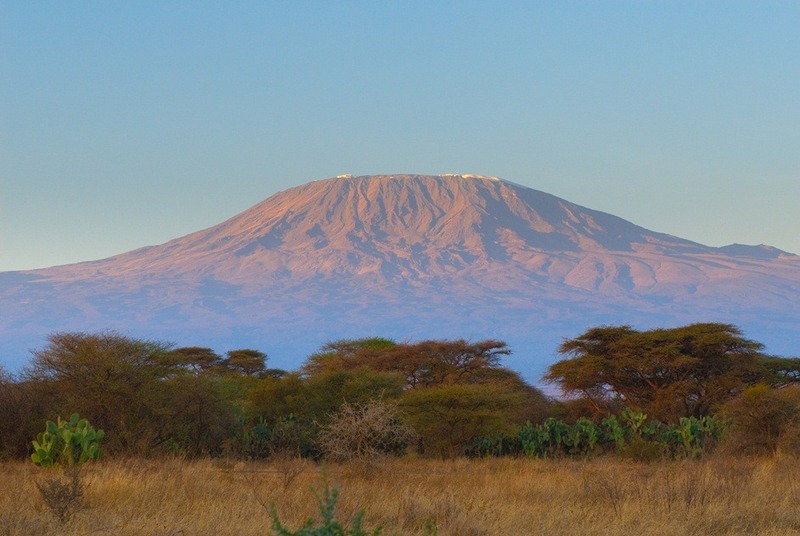 A sky island more at home in the far reaches of the northern and southern hemispheres than the equatorial tropics, Kilimanjaro has amazing biodiversity. 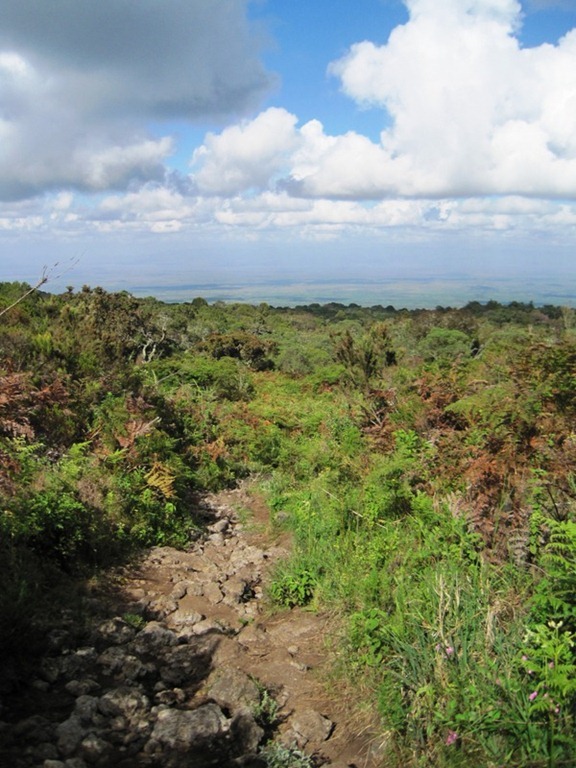 Lowlands: Between 2,600 and 5,900 feet (790-1,800 meters), this is the subtropical area located just above the Serengeti plains. 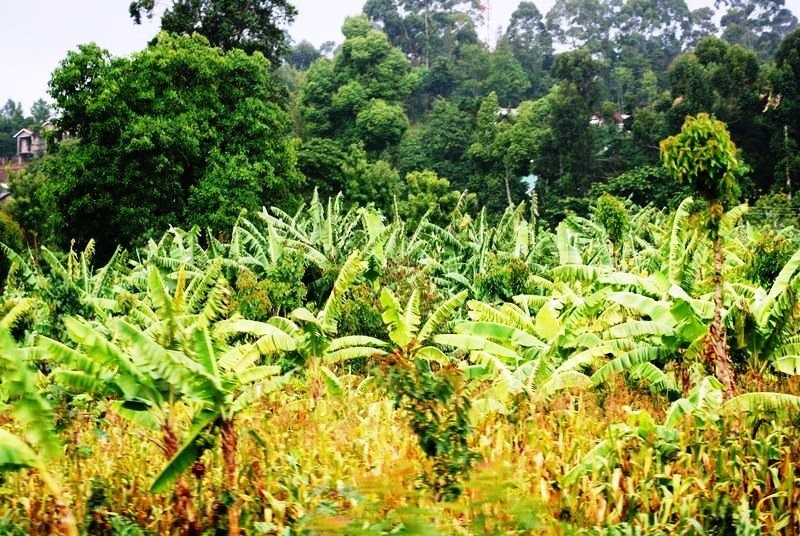 An area with heavier rainfall, its vegetation is dominated by banana, coffee, and other plants grown as crops. 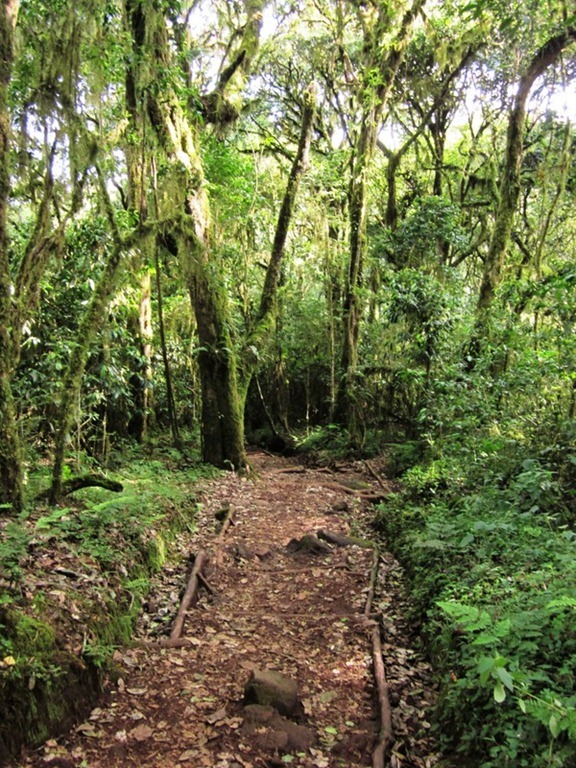 Rainforest: Between 5,900 and 9,200 feet (1,800-2,800 meters), this is a subtropical rainforest rich with plant and animal life. 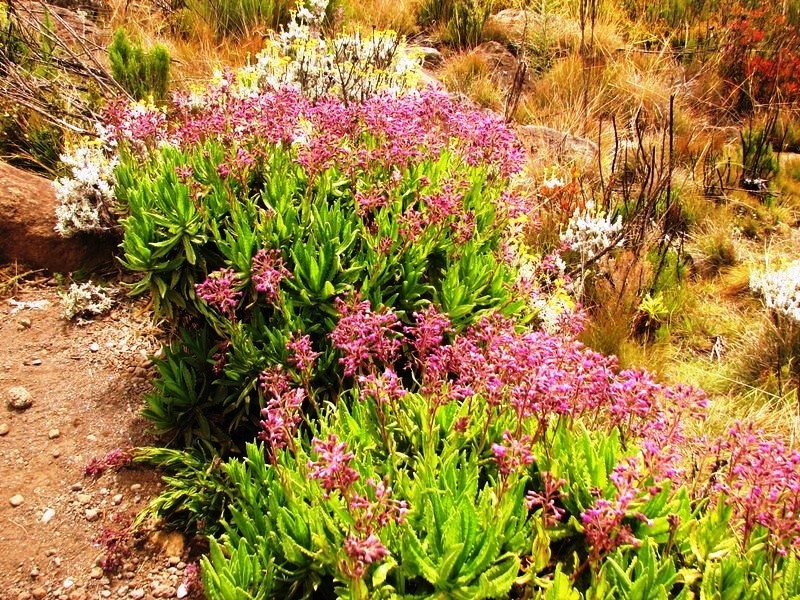 The widest variety of flowering plants range in this zone. 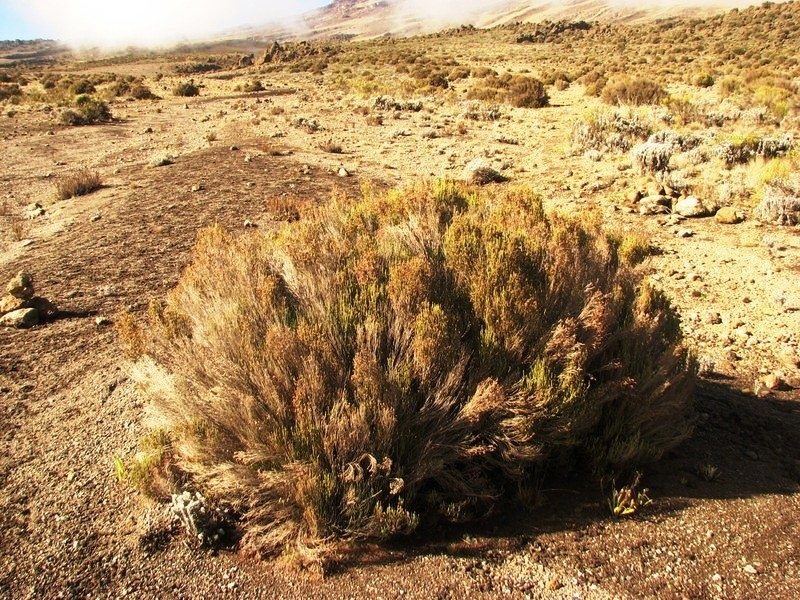 Moorland and heather: Between 9,200 feet and 13,100 feet (2,800-4,000 meters), this area has less vegetation and is dominated by a few plant and animal species, including groundsels, lobelias, heather, and tree moss. 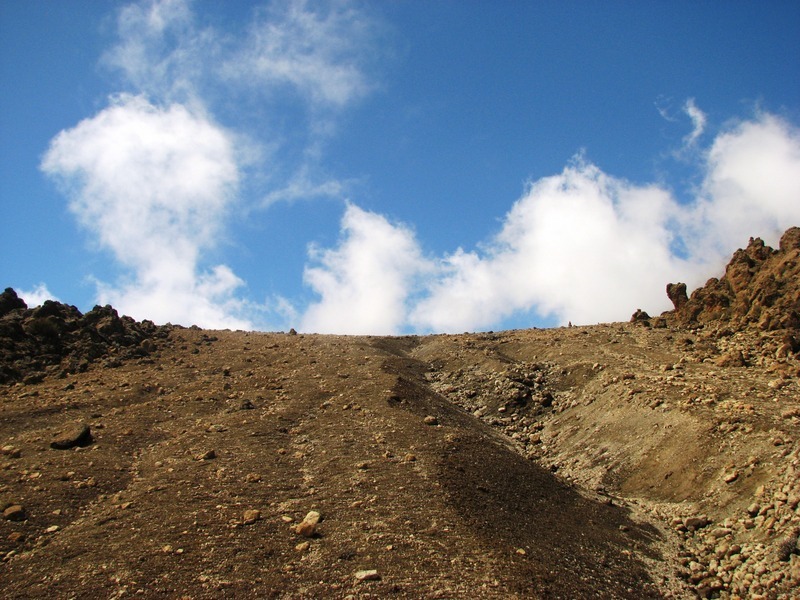 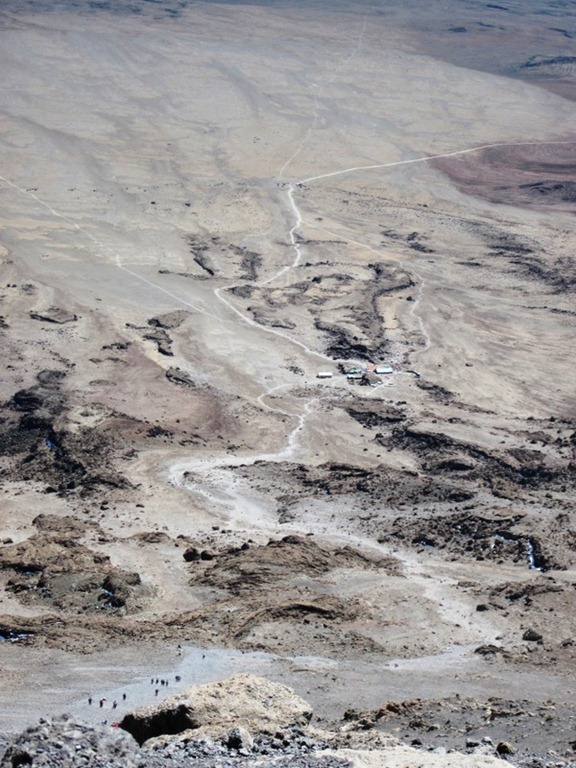 Trees disappear above 13,000 feet. 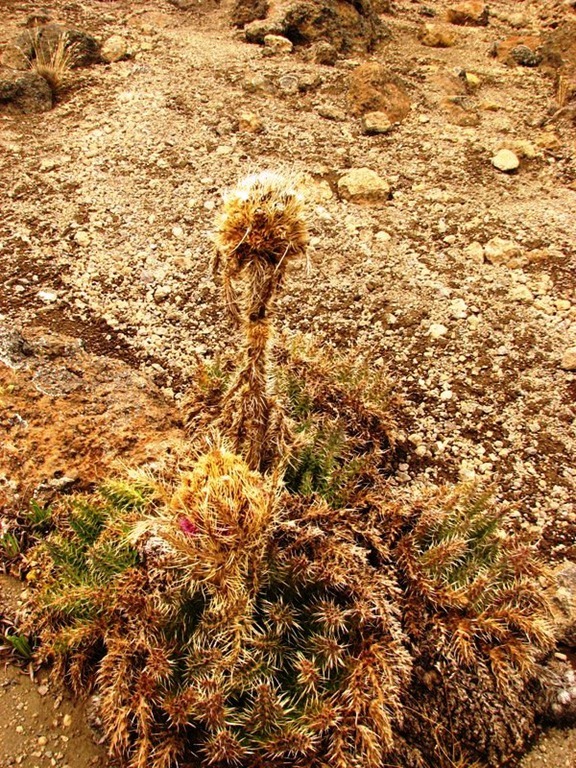 Alpine or high desert: Between 13,100 and 16,400 feet (4,000-5,000 meters), this arid, semi-desert zone has no trees and few plants. 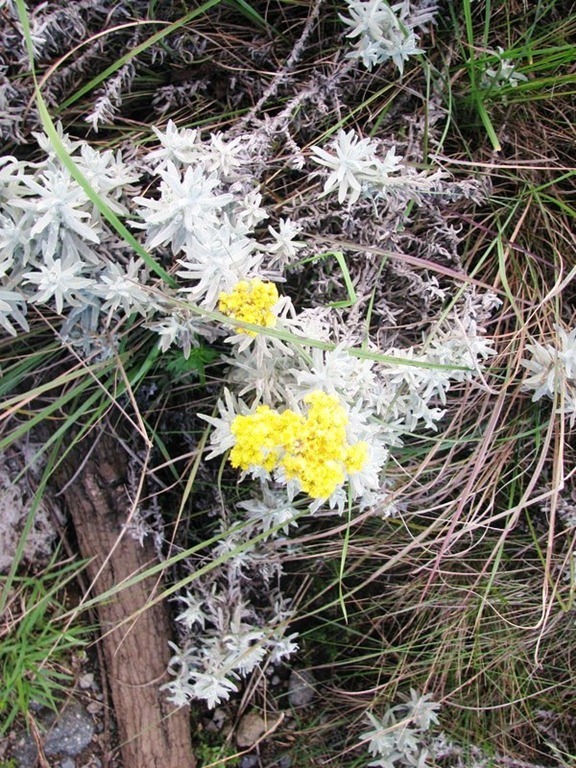 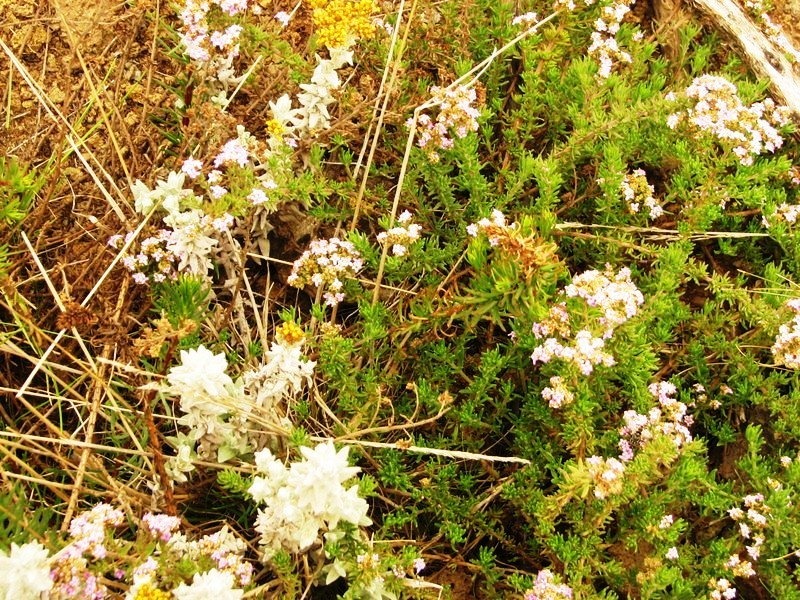 Sage grass, hearty helichrysum flowers, moss, and thistles are common there. 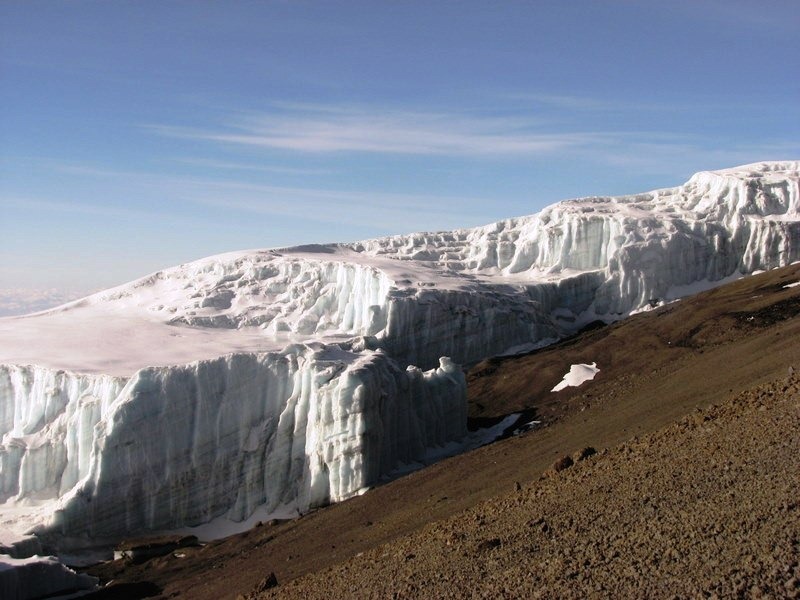 Arctic or summit: Above 16,400 feet (5,000 meters), this is an arid zone with intense sunlight, thin air, and heavy snow and ice. 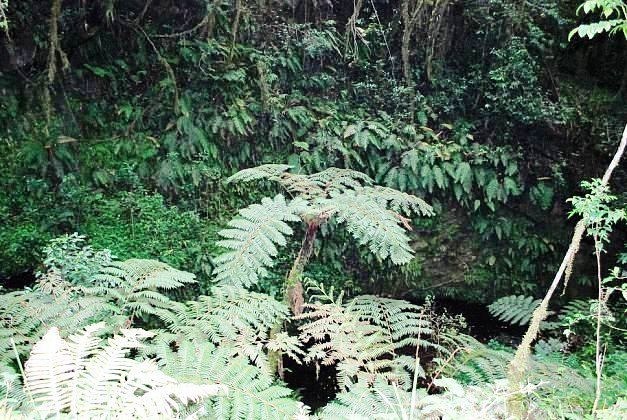 Few to no plants grow there. 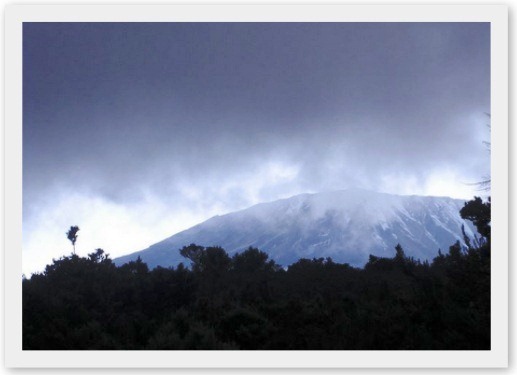 The southern and western slopes of Mount Kilimanjaro are wetter than its northern and eastern sides. 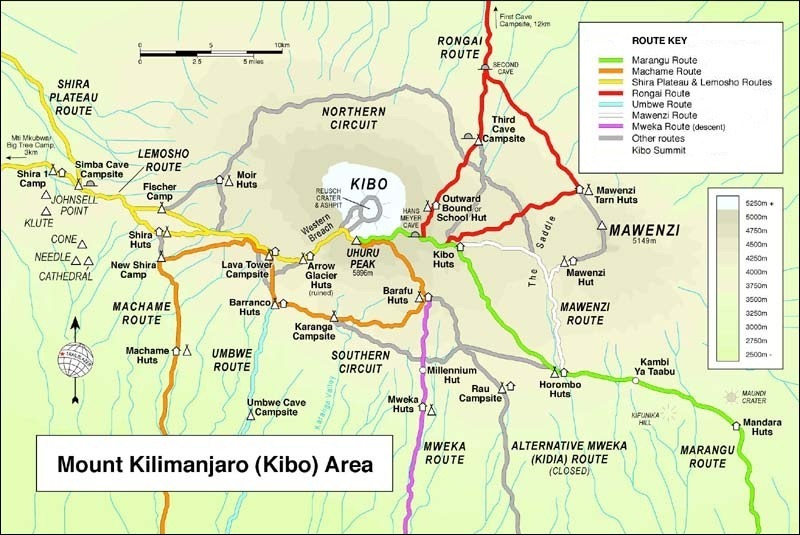 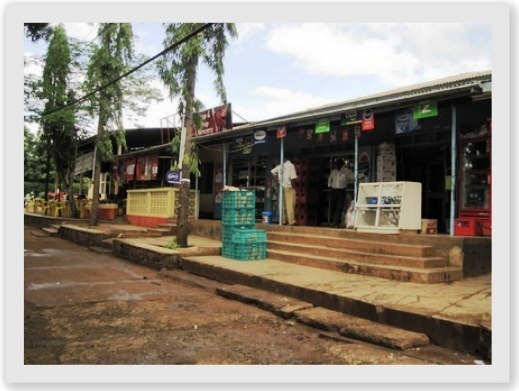 The city of Arusha to the west of Kilimanjaro sits in a tropical bowl, while the Serengeti Plains to the northeast are dry. 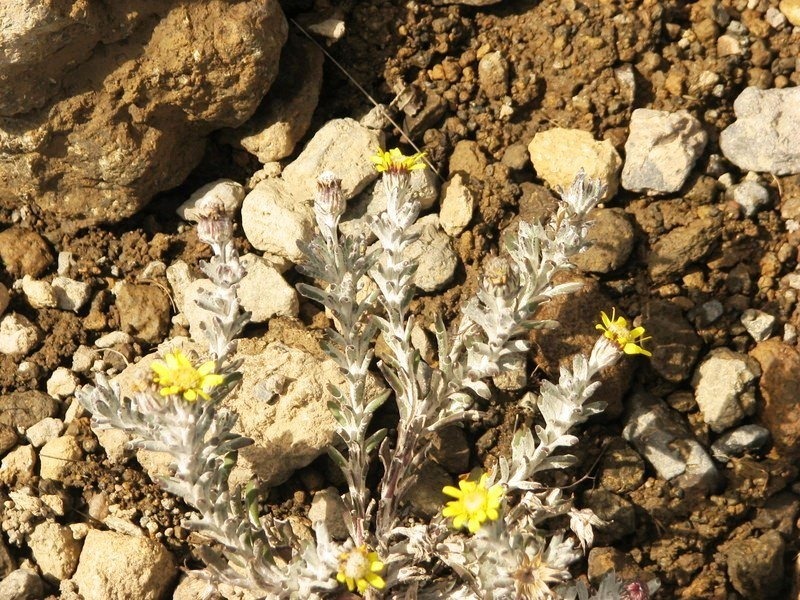 Here are some of the species of plant I encountered during my climb. 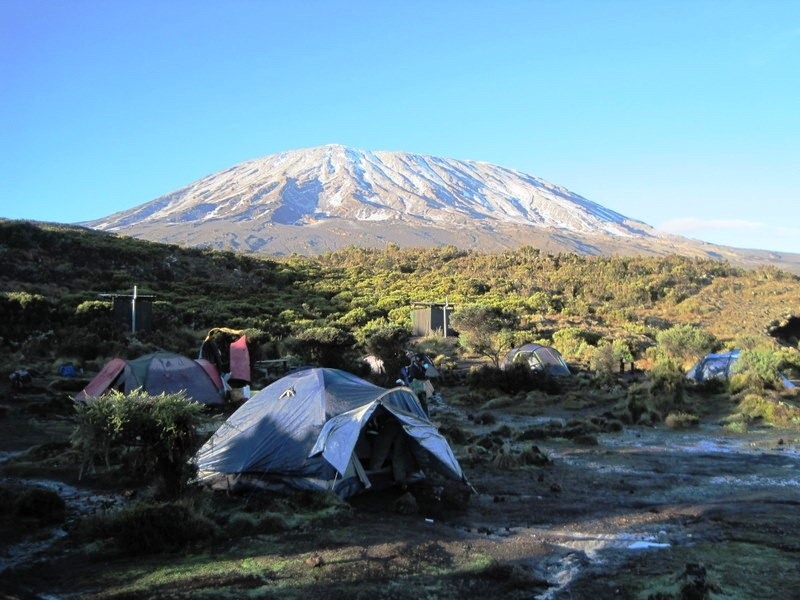 The south side of Kilimanjaro is a fertile landscape filled with windswept views of stunted forests and swaths of vegetation. 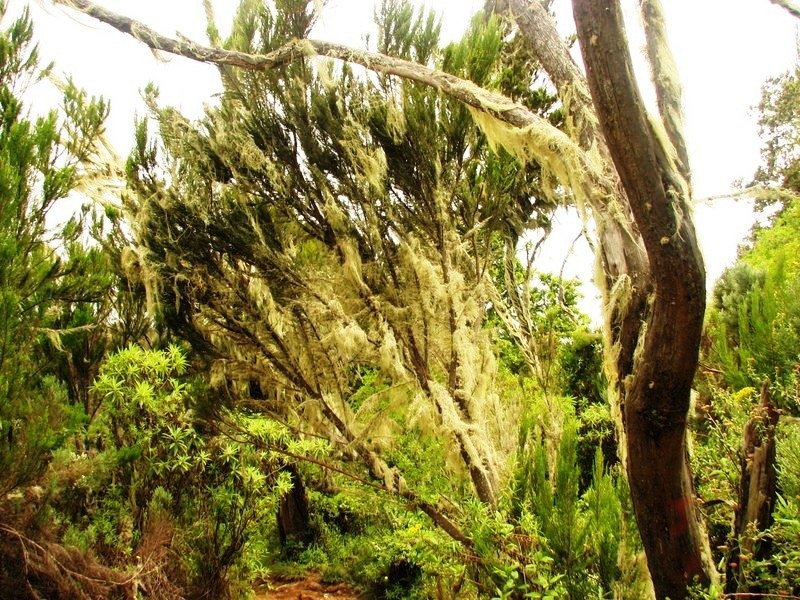 In the subtropical lowlands, wispy bunches of tree moss hang from the trees like tattered voiles ready to spring back to life when the rains return, transforming the forest into a fantasy land. 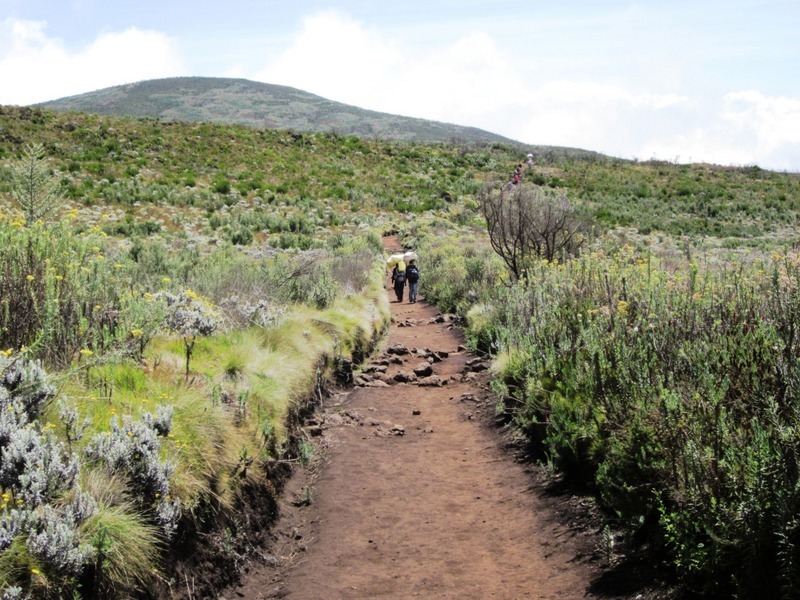 The north side of Kilimanjaro offers a more Alpine landscape with heather and moorlands dominated by tussock or bunch grass. 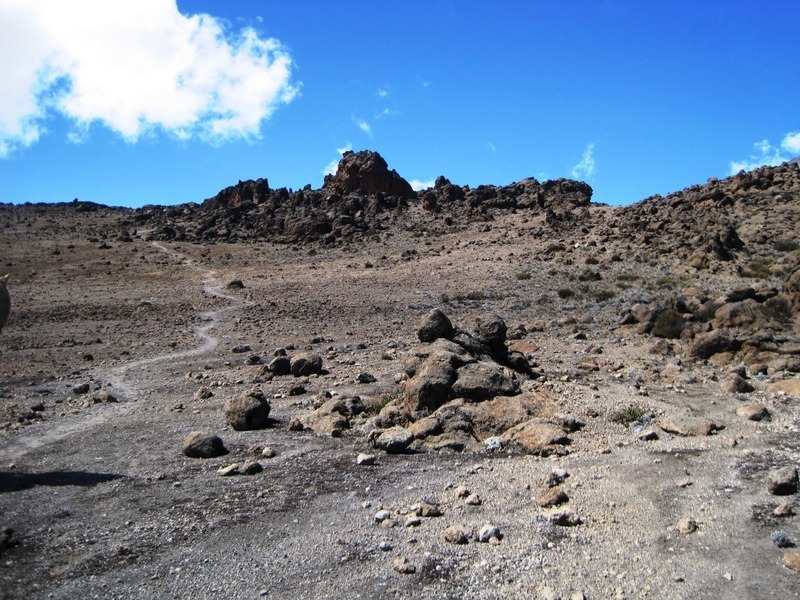 The view there is more desolate and, in some ways, more intriguing as the vegetation quickly gives way to the exposed mountain. 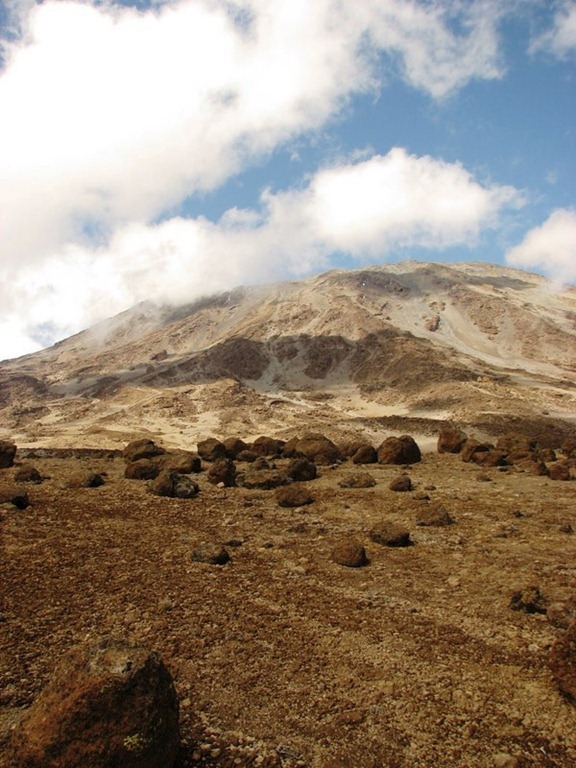 Mountaineers who climb fields of rust-tinged rocks are often left with the impression that they are on the surface of Mars. 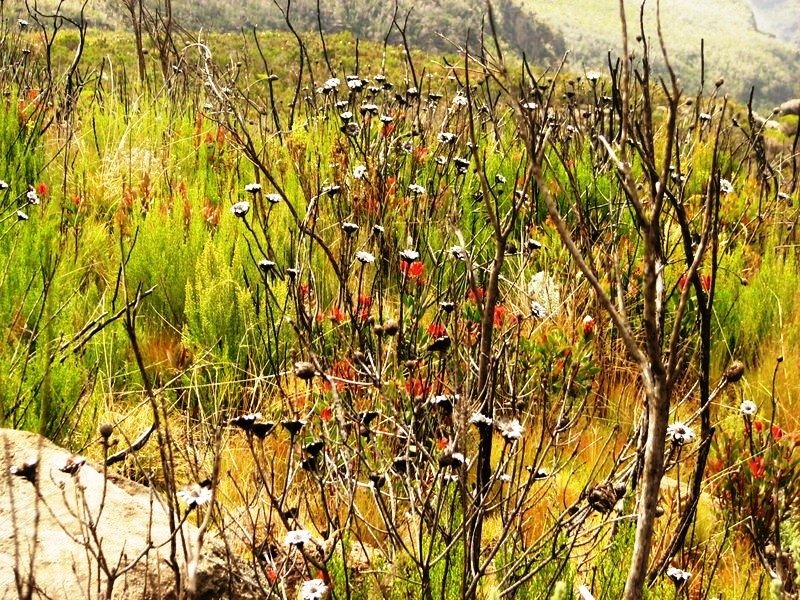 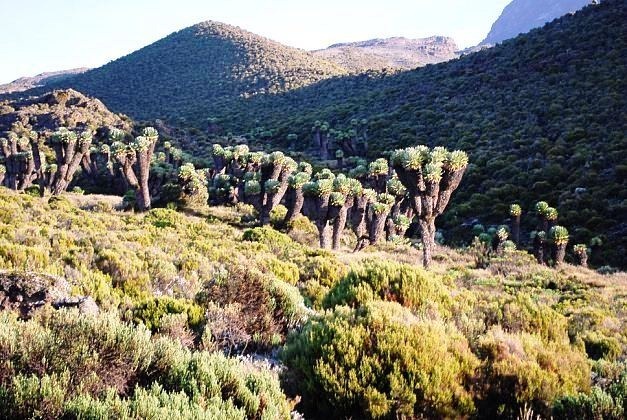 In the highlands, the view is dominated by groundsel trees, or dendrosenecios, with trunks like palms and topped with spiky leaf rosettes, as well a cactus-like flowering plant known as the lobelia deckenii. 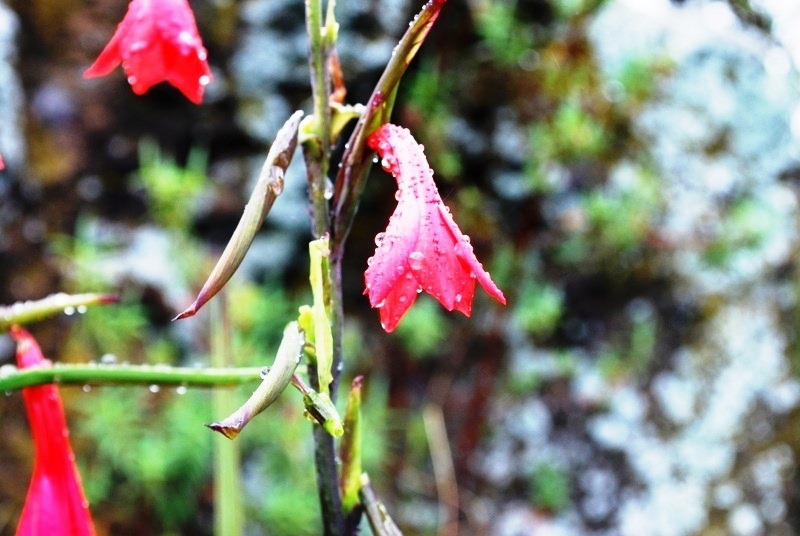 Because few plants grow in the high desert, those that do such as sage grass and lobelia deckenii are photo ready. 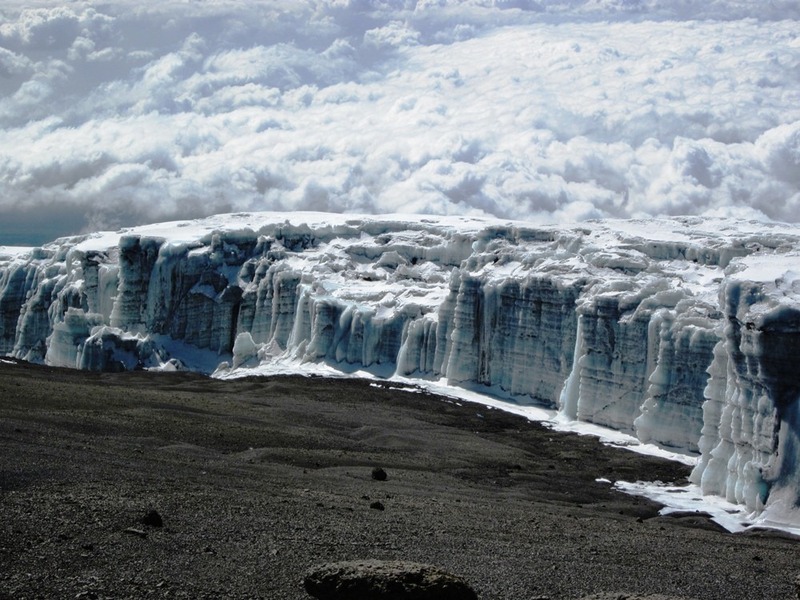 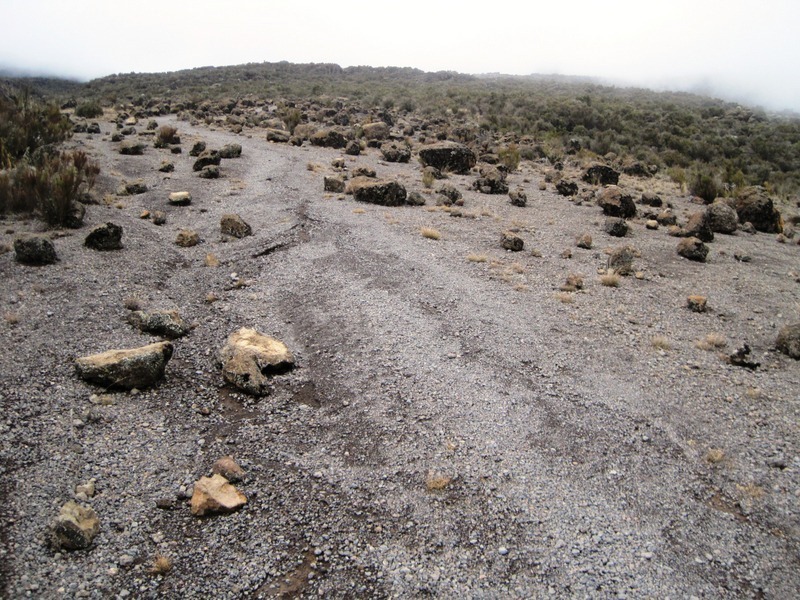 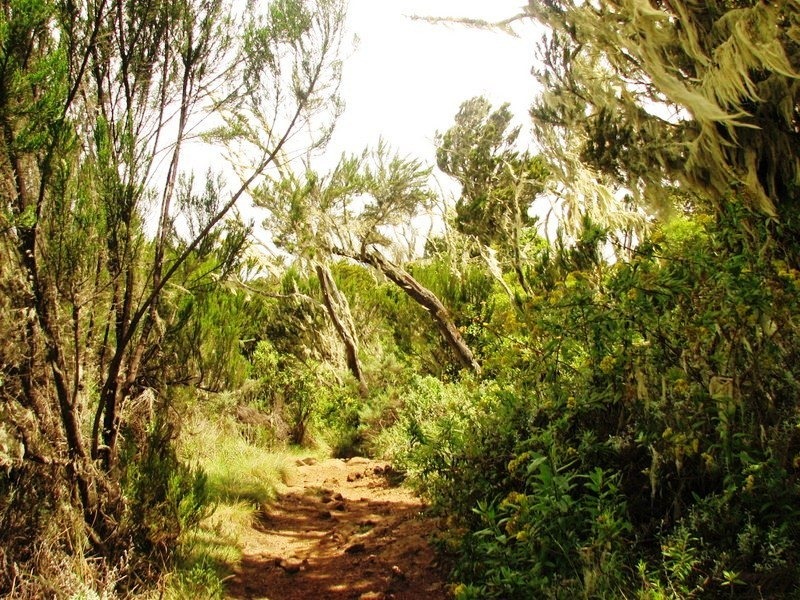 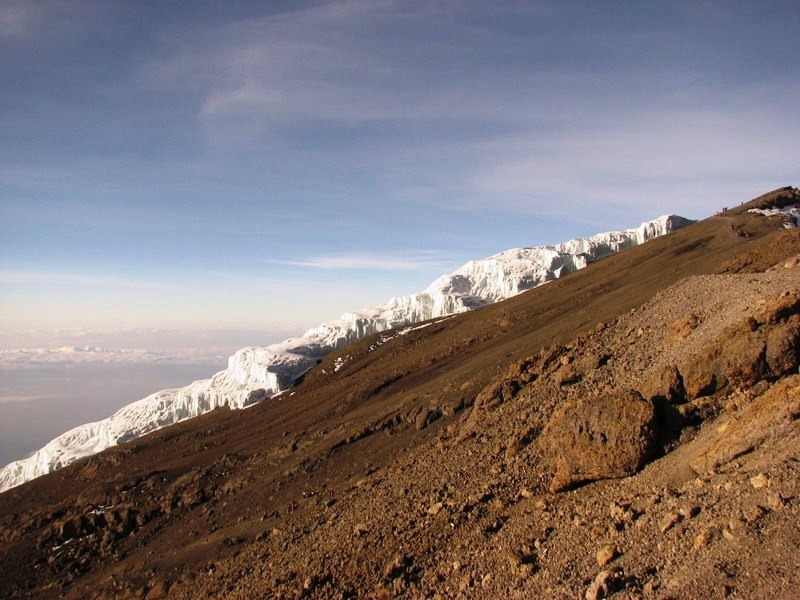 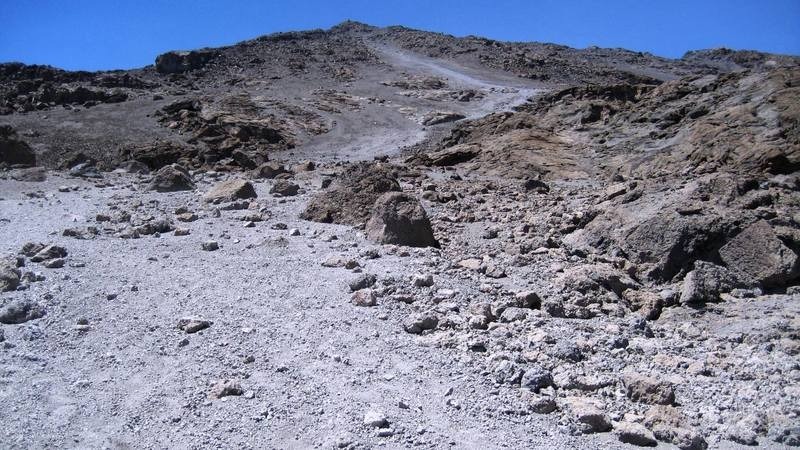 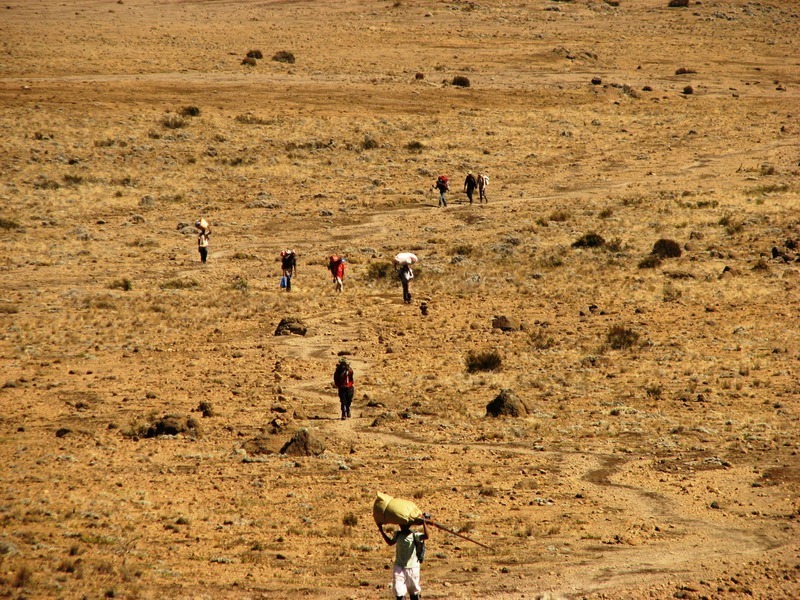 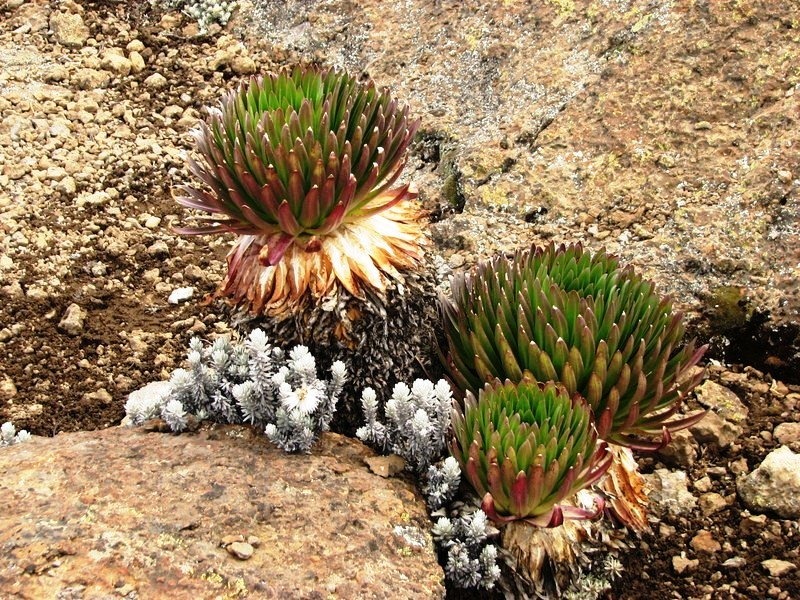 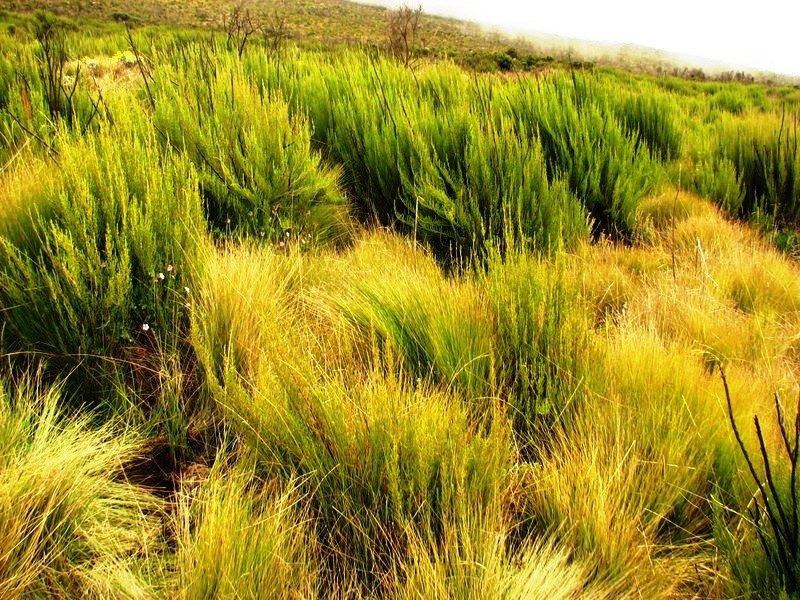 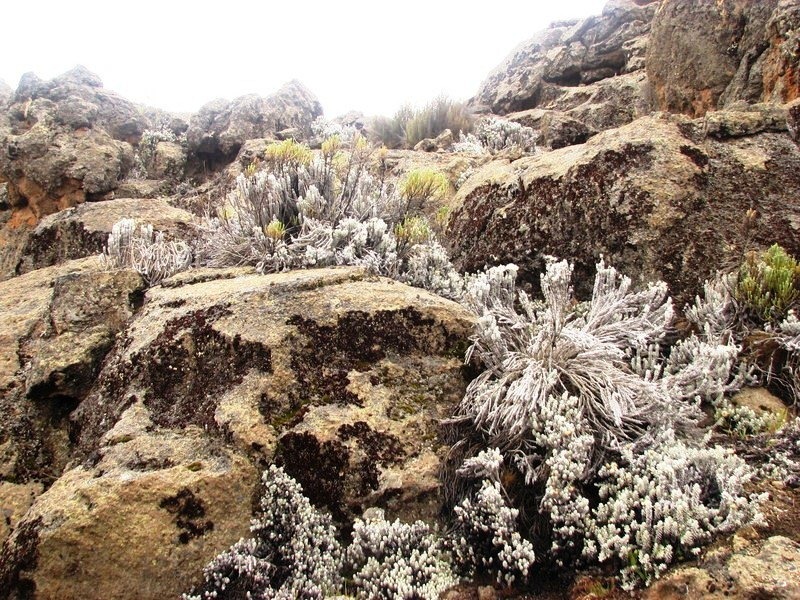 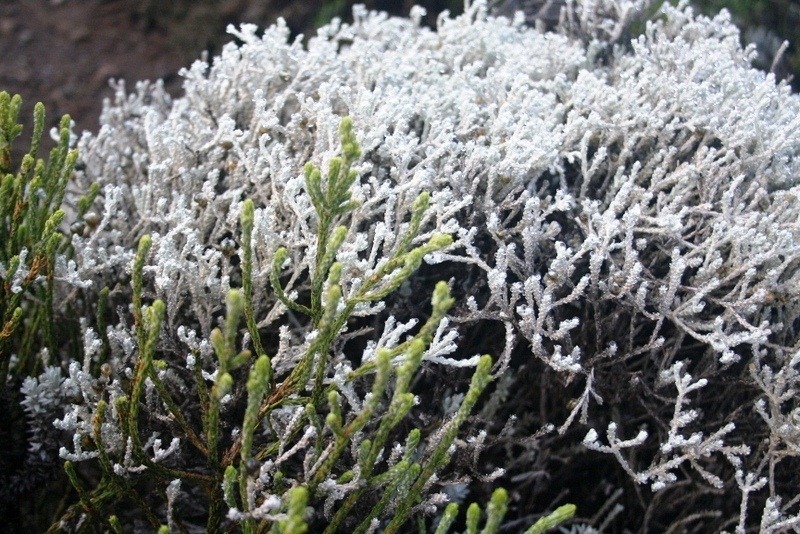 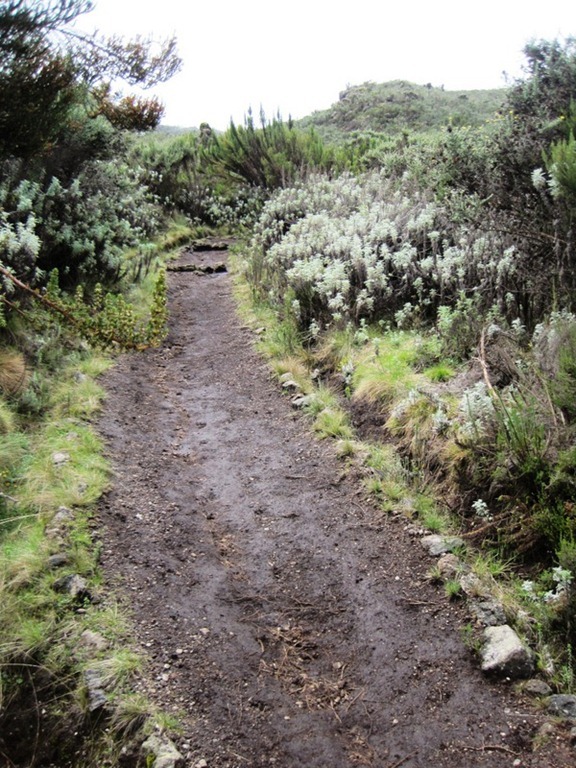 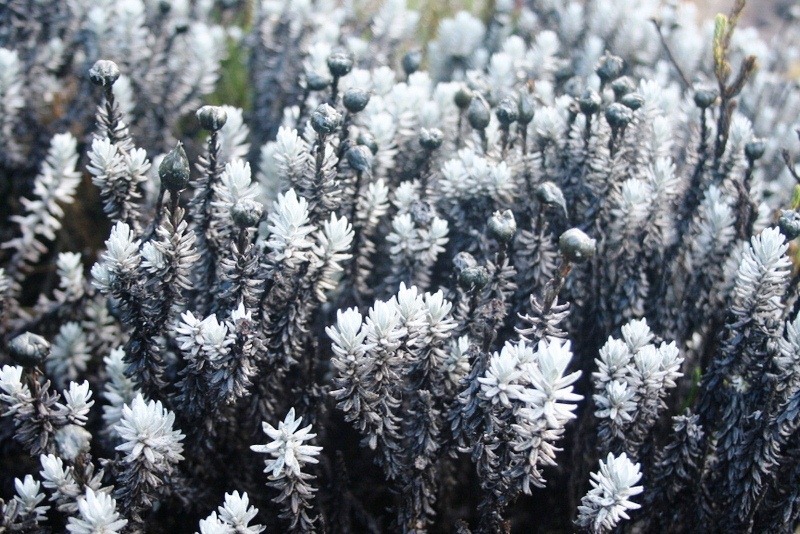 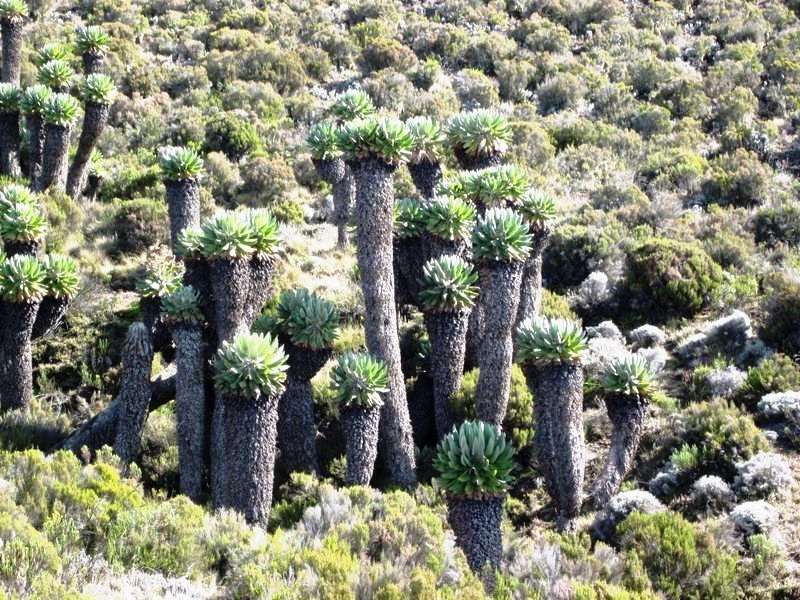 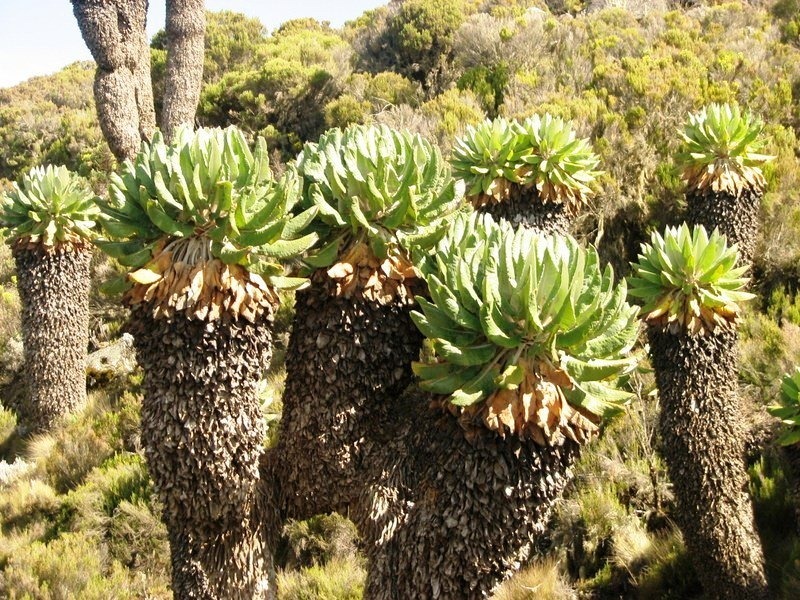 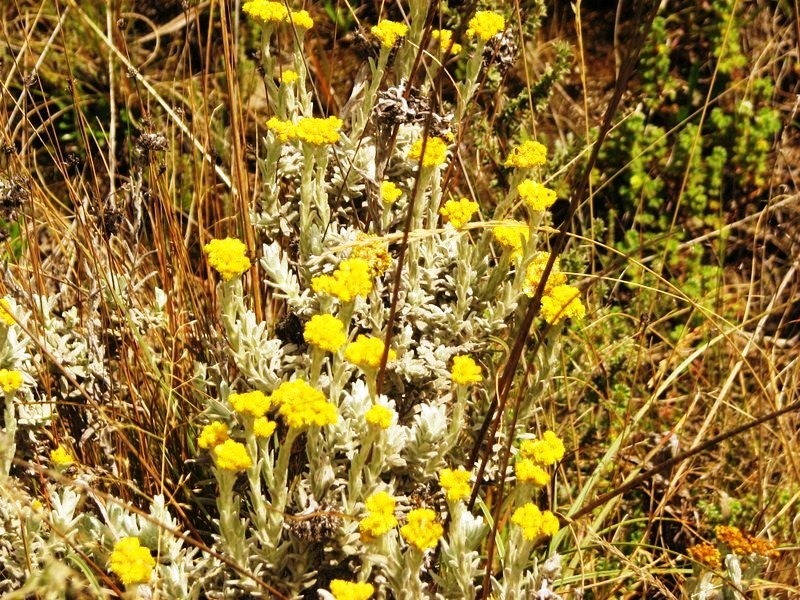 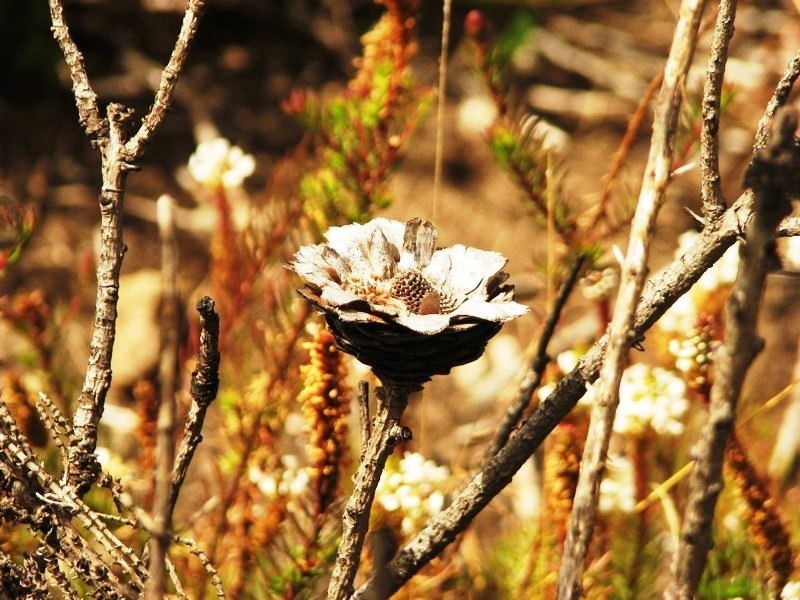 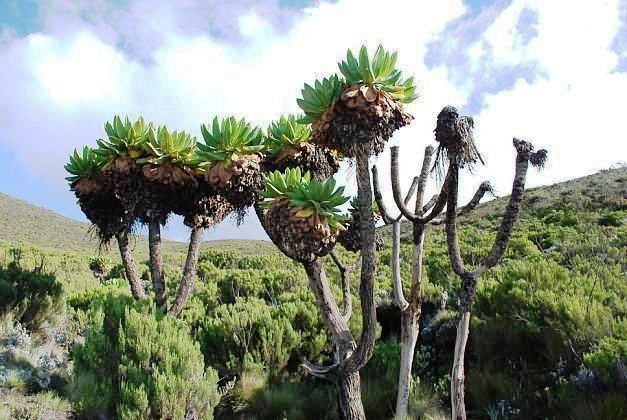 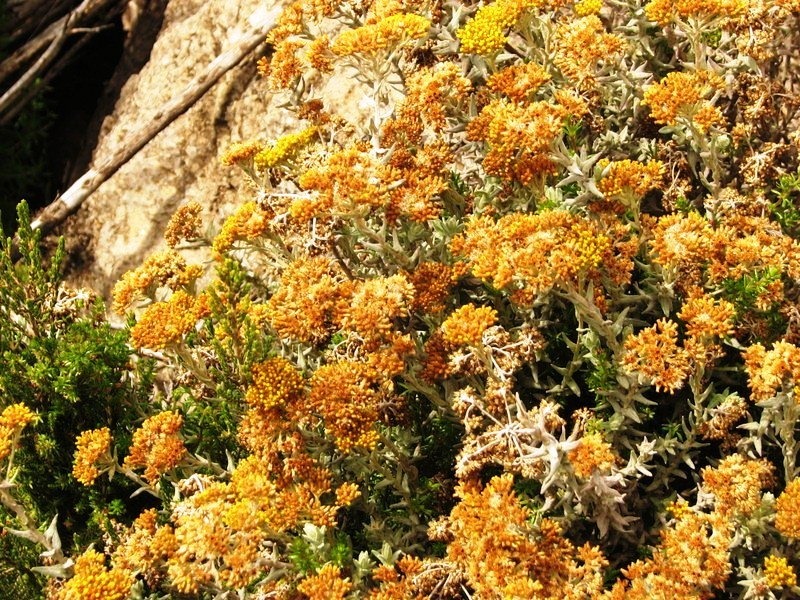 Unlike humans, the vegetation is hearty enough to survive the harsh climate on Kilimanjaro. 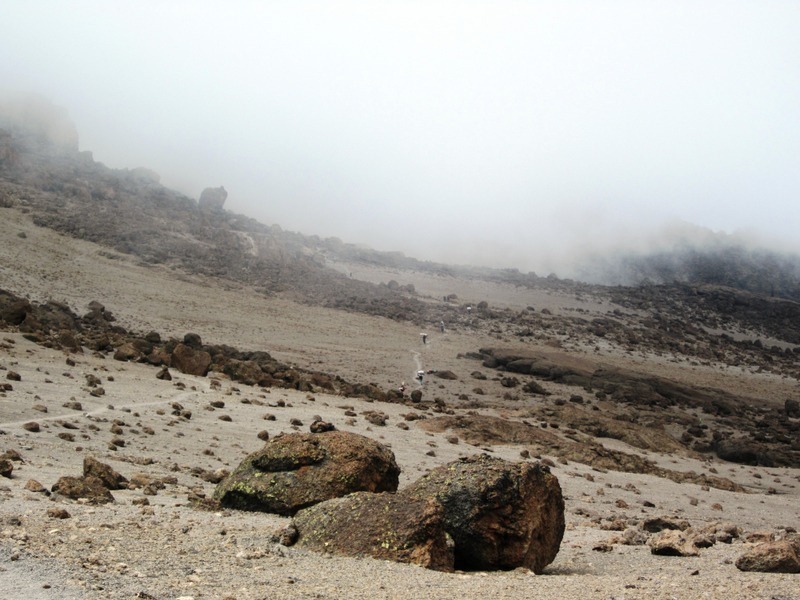 Still, the mountain has a way of twisting everything at this altitude into bizarre and fascinating shapes. 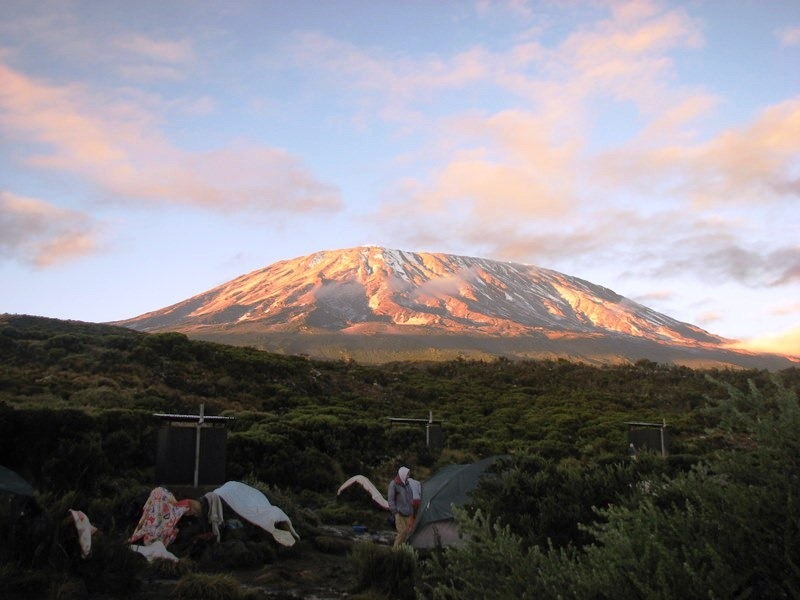 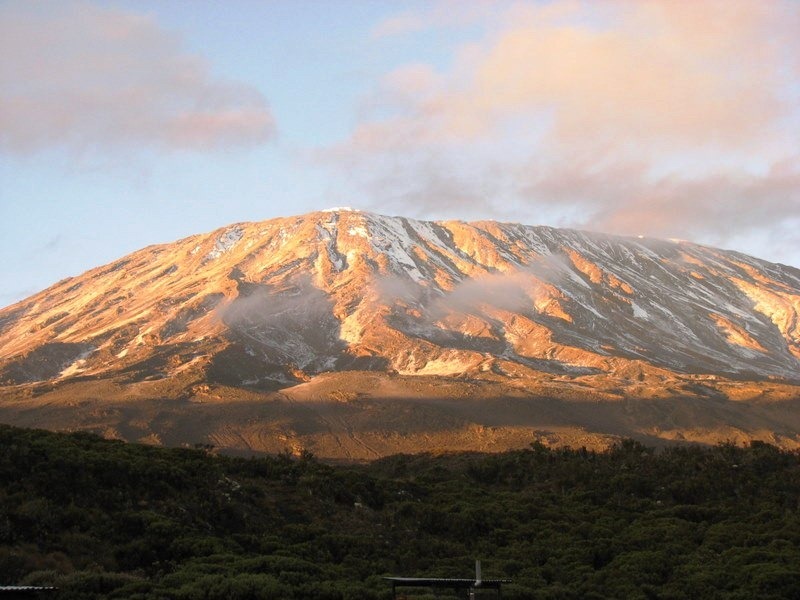 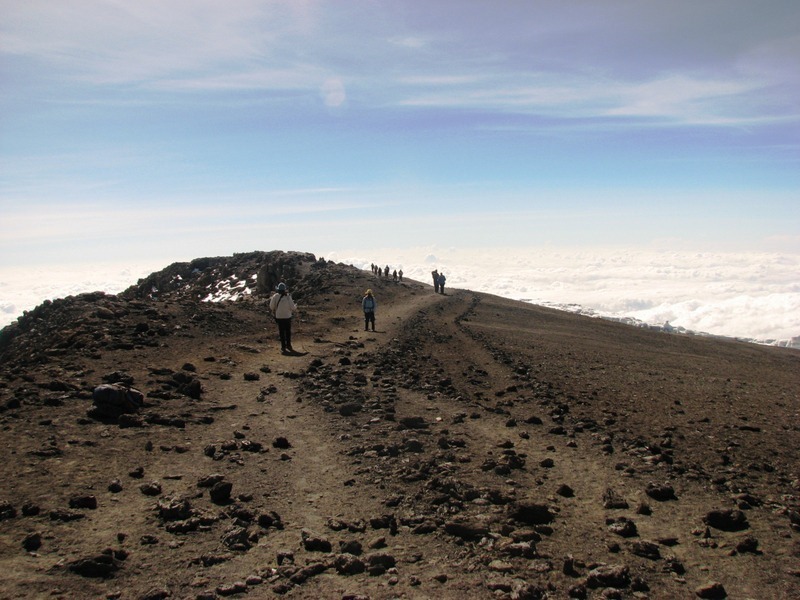 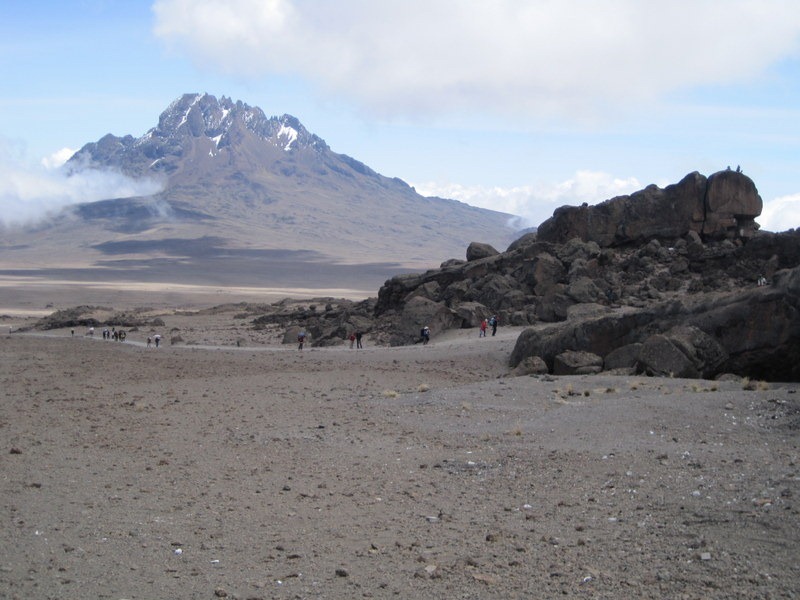 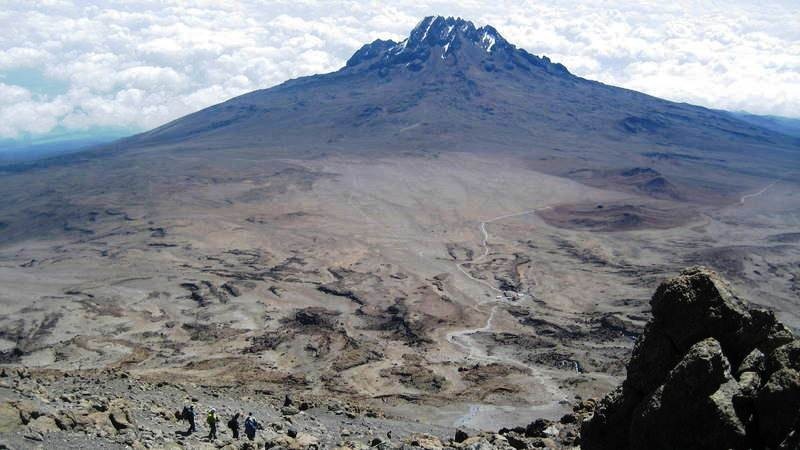 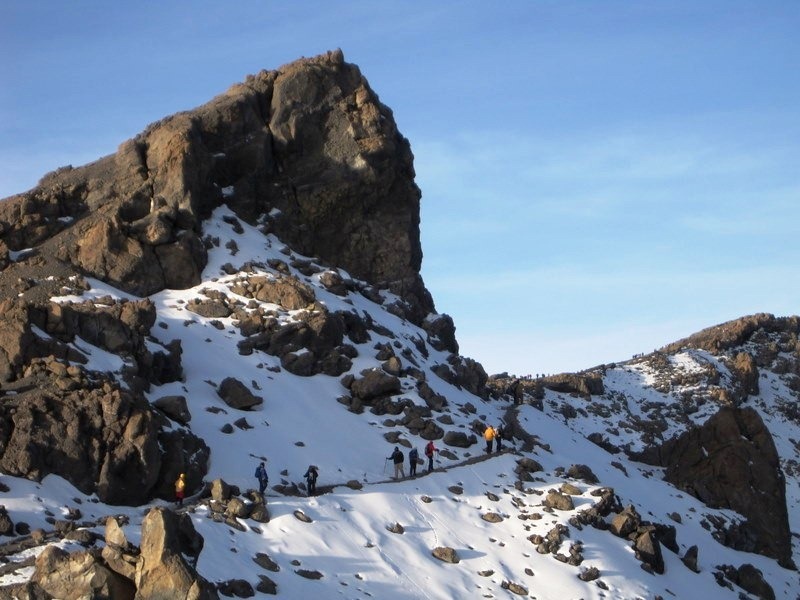 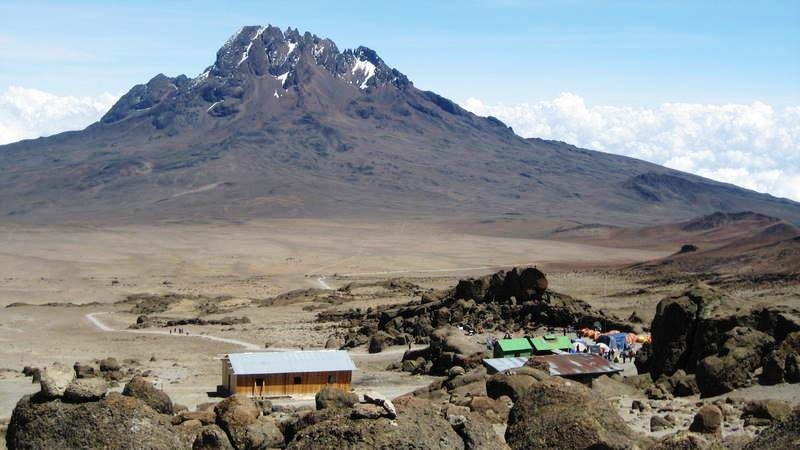 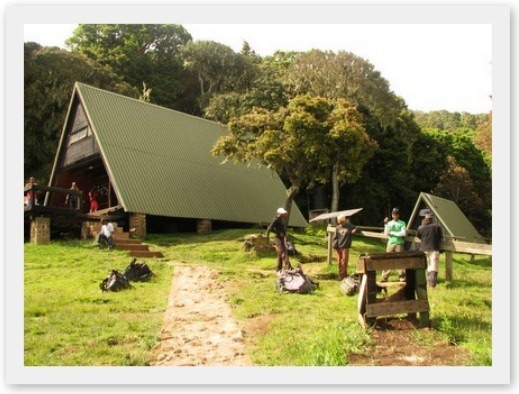 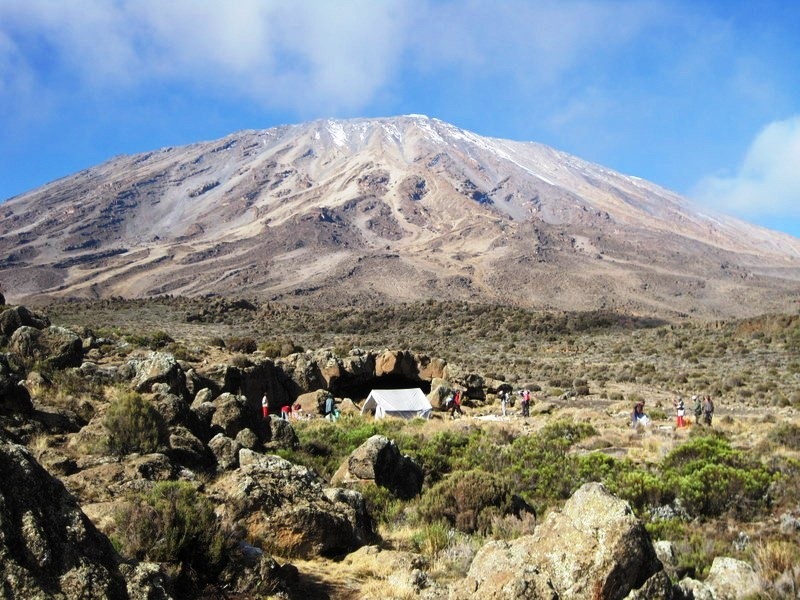 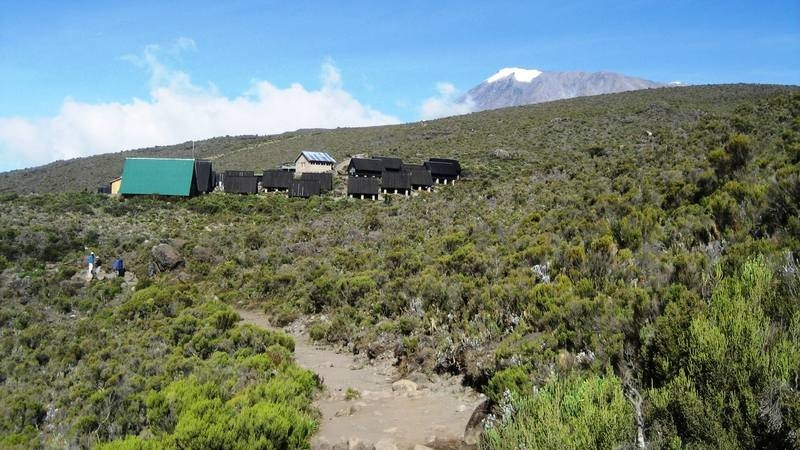 If you’re thinking about climbing Mount Kilimanjaro, imagine yourself hiking through these places over a few days. 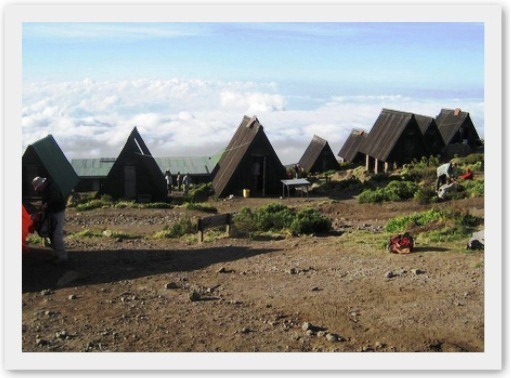 If you’ve already been there, I hope that these photos will bring back memories and help you put names to some of the beautiful foliage you saw on your way to and from the summit. 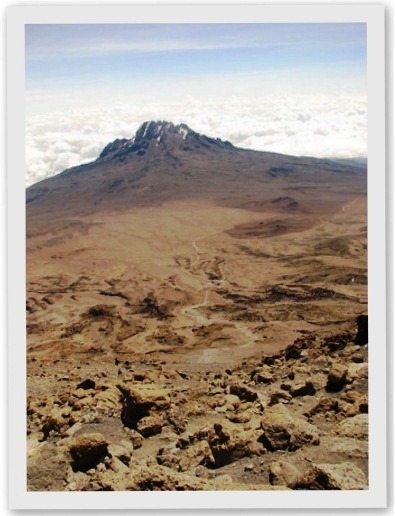 “Kilimanjaro: One Man’s Quest to Go Over the Hill” Now in Print! 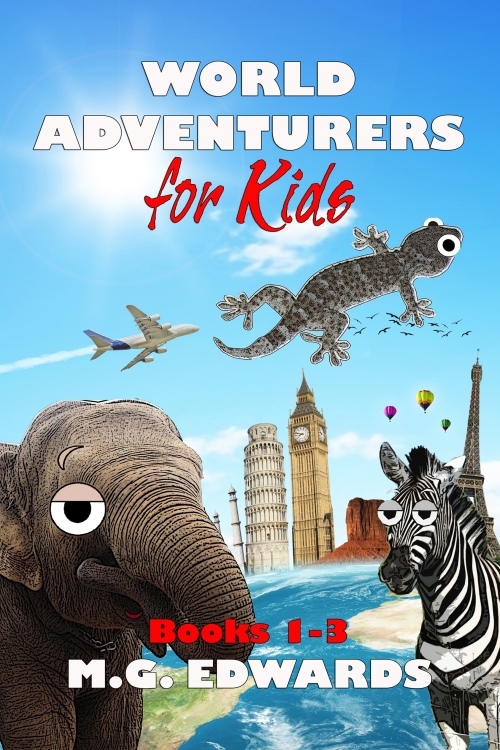 Now Available in E-book and Print! 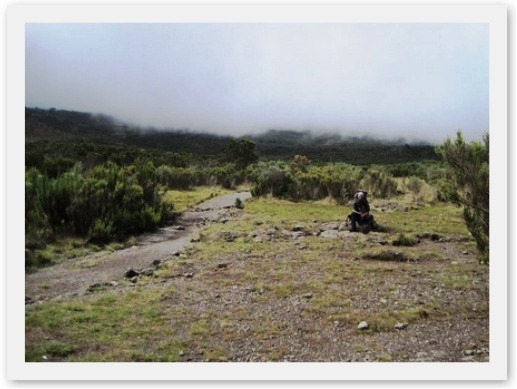 Click here to read a short excerpt from the book. 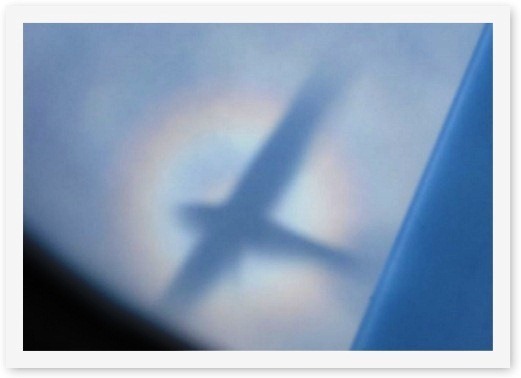 A longer excerpt is available to read here. 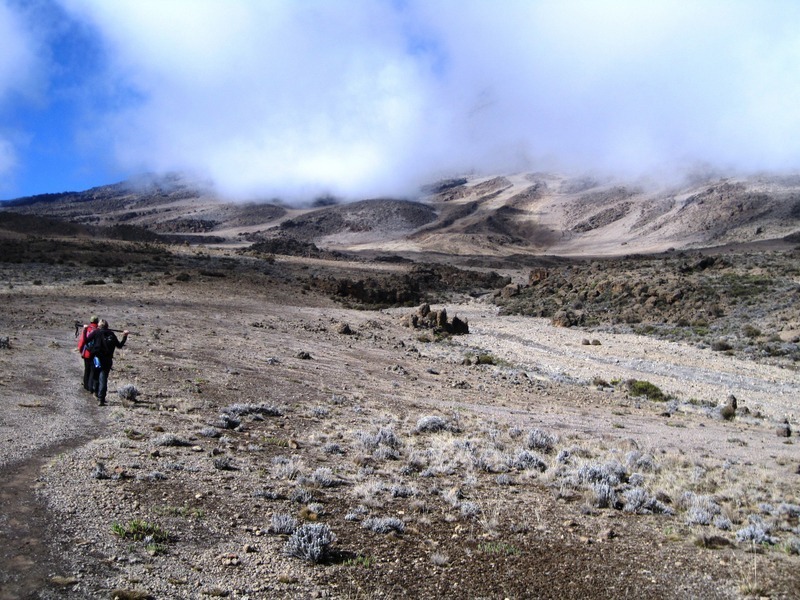 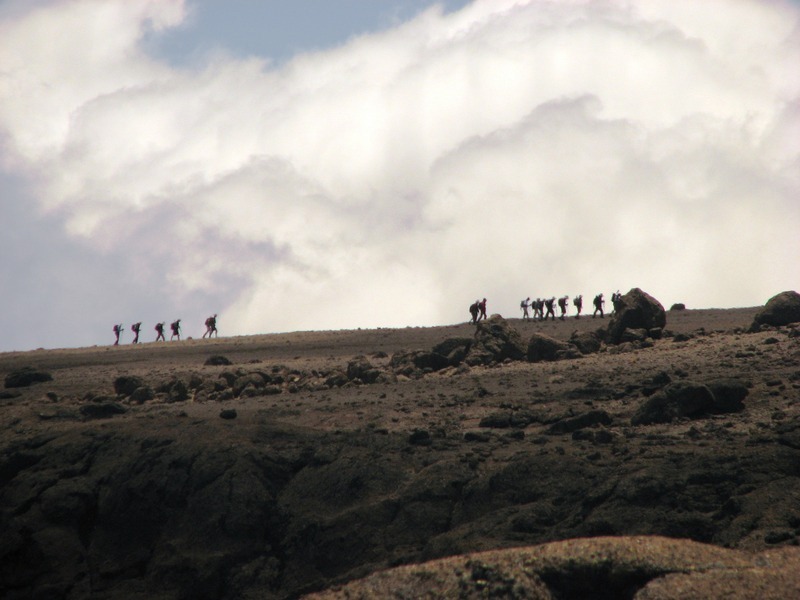 Kilimanjaro includes more than 60 photos from the author’s trek. 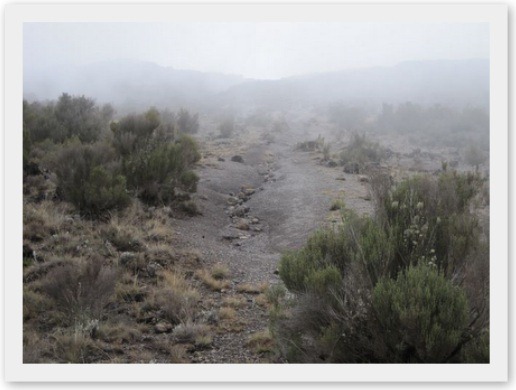 Here are some of the photos featured in the book.